Originally I didn't intend to go to Vegas in May, I was going to skip that month but when I found out that I could see my friend Boots before she returned home, that Gwen, Gator and his family, Jon, Jeff, Roz, Albert and other friends were going to be there resistance was futile. The plan was to stay 2 nights at Cosmopolitan and then since Gwen and the Gators were staying at MGM Grand I was going to stay there for the first time on a offer that was 2 comped nights with resort credit, however I was only going to sleep there the one night unless I was getting nightclub noise at Cosmo. Yes, I was anticipating nightclub noise issues at Cosmo due to the tweets I was reading about it. My Southwest flight on Wednesday, May 28th out of San Jose was on time and everything went smoothly. Taxi line was short and my driver didn't try to long haul me. I arrived at Cosmo at 11am, and quickly went through registration with a lovely one bedroom terrace fountain view room on the 36th floor. I only had time to drop off my luggage as I was meeting my friend Boots for lunch at the Wicked Spoon. Boots had already been at Cosmo for 3 nights and was leaving for the airport in a couple hours. For those of you who are Gold or Platinum level with the Cosmopolitan Identity player's club you can buy the Wicked Spoon Buffet 2 for 1, but unfortunately as we found out when we tried to do that, you have to check in with the player's club first, they won't do it at the Wicked Spoon cashier desk. Neither one of us wanted to make the trek back downstairs so Boots who was treating me to lunch ended up paying full price. It was great to see Boots again since we hadn't seen each other since February. I just wish I had been able to arrive a day earlier to spend more time with her. While Boots lives in San Francisco and I'm only about 40 minutes south of there, it's easier to actually meet up most of the time in Vegas! As always I had a great time catching up with Boots and she gave me some advice on some slots that she had done well on in case they were still active with their bonuses. We also had a chat about all the noise she had been hearing late at night from the new Drais nightclub that is on the roof of Cromwell. After lunch Boots and I said goodbye as she was checking out and leaving for the airport. I returned to my room to unpack my clothes and guess what I heard from my bedroom? Yes, music and noise from the rooftop pool of Cromwell. Deciding if it was going to be that noisy in the daytime I wouldn't be able to sleep later that night I went downstairs to registration and tried my best to get a room that wouldn't hear loud music until 5am in the morning. 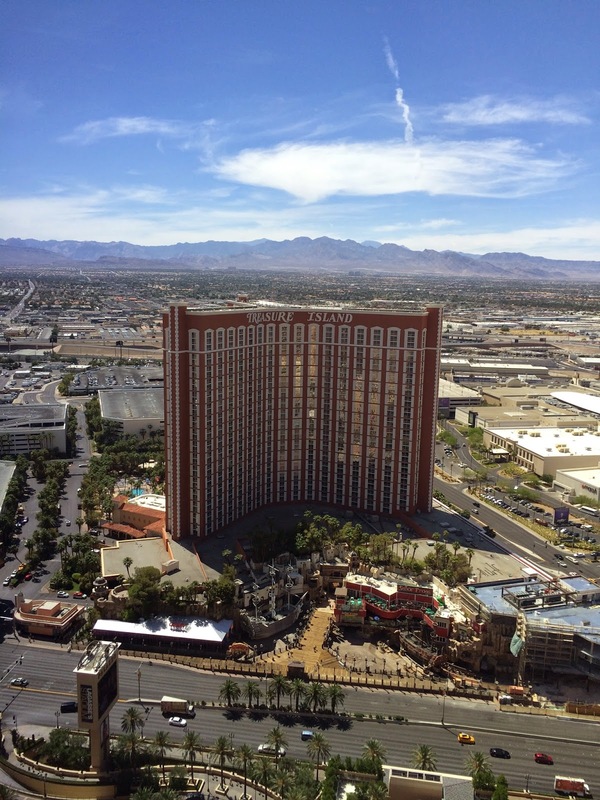 The nice guy I had at registration honestly did his best, and found me a terrace one bedroom as far from the strip as you can get and still have a fountain view and it was on the 59th floor! Great room and view so I changed and unpacked. 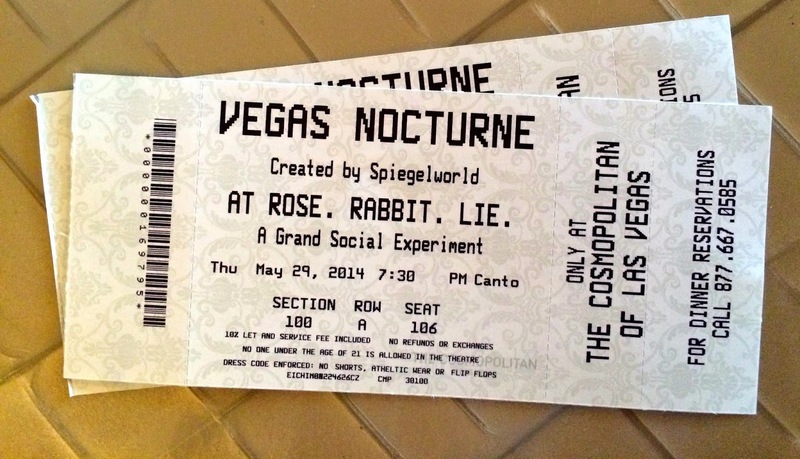 My offer from Cosmo this time was 2 comped nights, with $190 free play and 2 comped tickets for Vegas Nocturne at Rose.Rabbit.Lie. I was taking my friend Terri and we had decided to do it Thursday evening for the 7:30pm show. To get the comped tickets I had to go get a comp slip from the Identity Player's Club desk and then go to the second floor box office desk of Rose. Rabbit. Lie to get assigned seats. When I arrived at the desk there wasn't a line and I received seats in the first row with one seat being on the aisle. After getting set up with the show tickets, it was time to meet up with Albert who is a friend I know from Facebook and Youtube who like me has a youtube slot channel, called (drum roll) Albert's Slot Channel! 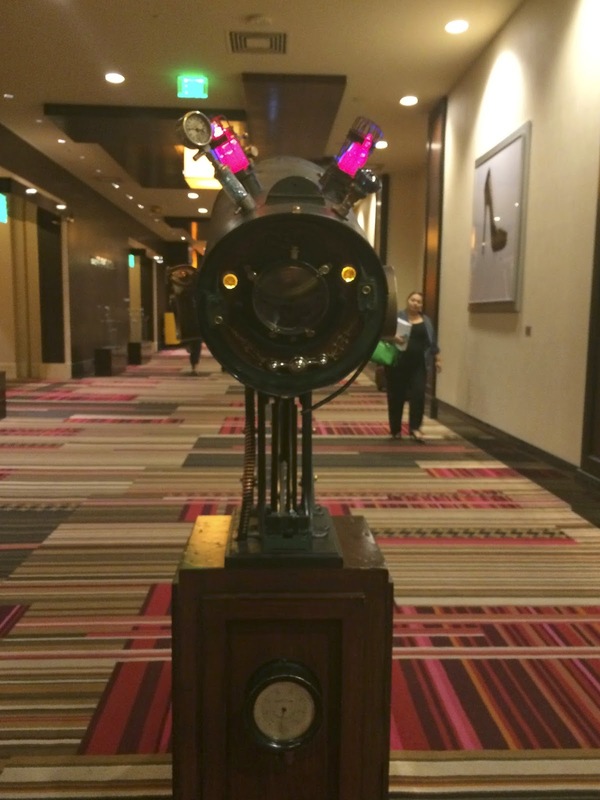 Albert was also staying at Cosmopolitan tonight before moving to Caesar's Palace for a couple days. Albert's a really sweet guy who lives on the east coast and visits Las Vegas 2 or 3 times a year as his parents and brother live here. 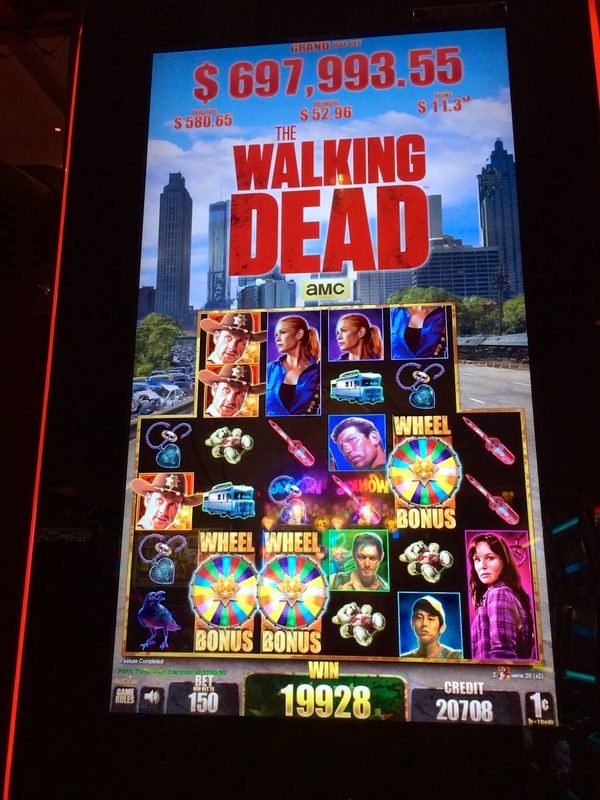 Like me he enjoys playing slots but also plays poker. I used to play Blackjack more then slots myself but that's another story. 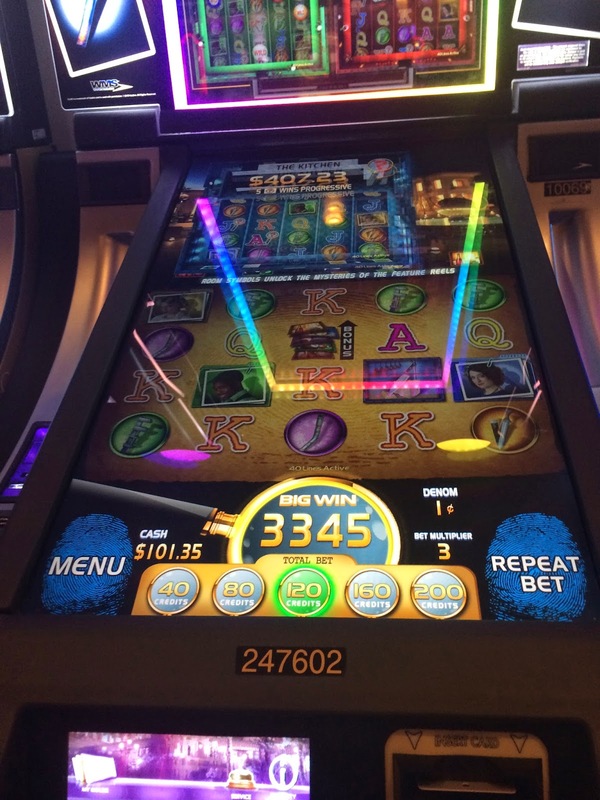 Our plan was to play slots together and hopefully record some good videos for our youtube channels. 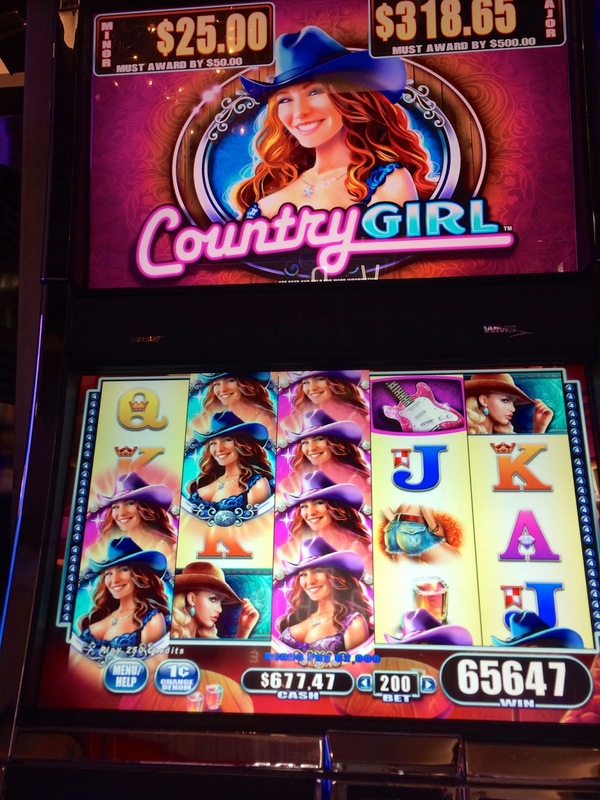 I hadn't played Country Girl by WMS but Albert suggested I try it and took me to where Cosmo has their only Country Girl slot while he sat next to me and played another slot. 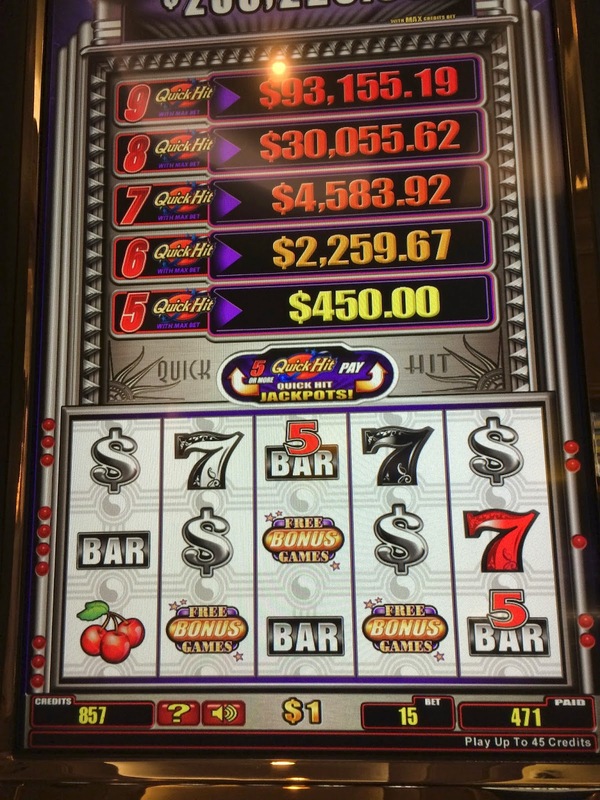 We were chatting away and my hundred was almost gone and I was thinking about what would be my second slot to play at Cosmo when I hit the bonus, and what a bonus it was! 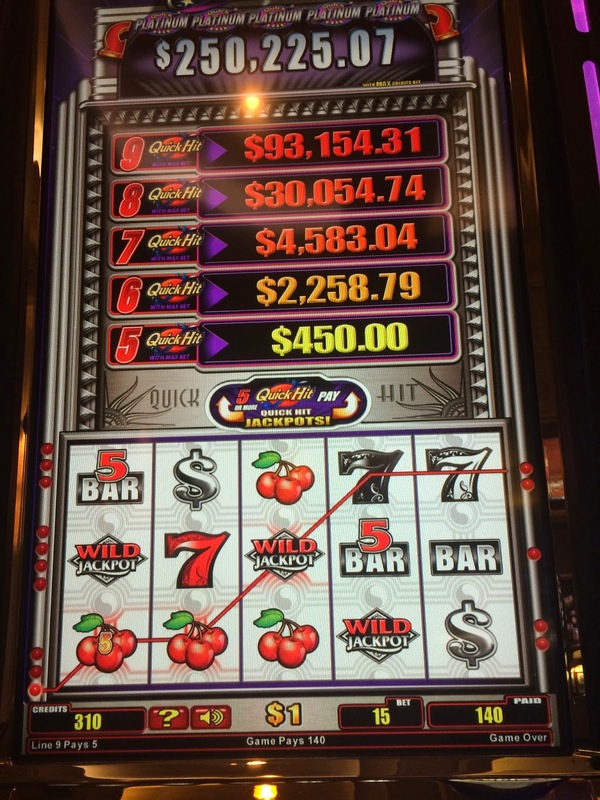 Always a fun way to start out a trip is to have a big hit on the first slot you play! I owe Albert for suggesting I play Country Girl as I don't think I would have even noticed it if not for him. Also, if Albert hadn't been sitting with me I think I would have given up on Country Girl after putting $50 through it. 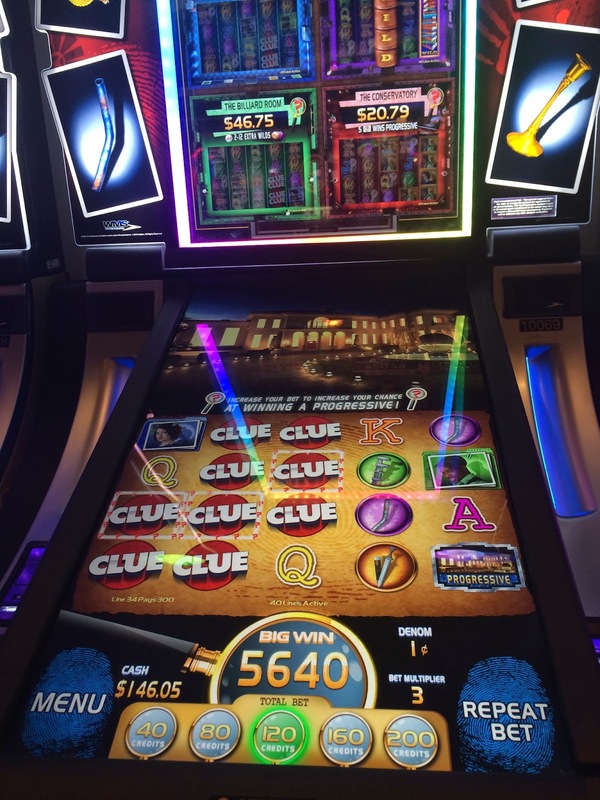 Albert and I played a few more slots at Cosmo including the community game Journey to Oz that we has some fun but low paying bonuses on but I wanted to walk over to Bellagio and play my beloved original Clue. So we walked over and I had a few fun bonuses low rolling on Clue. I didn't want to bet max or use my M-Life players card because that seems to trigger a trip with M-life and my offers go downward when I do that. Aliyah was one of the friendliest, charming most alert babies I have been around! Very well behaved and you could tell she was loving the activity of the sights and sounds of Vegas. Of course there are sometimes inappropriate sights and sounds in Vegas but at her age they aren't going to mean anything to her. Also her parents are responsible and aren't the type you see wheeling their children in strollers around the strip after midnight, Aliyah and her Mom were back at their room at appropriate hours, keeping Aliyah's meal, nap and bedtime schedule to her normal hours. After Albert and I had a nice chat with Gwen and the Gators they went on to dinner and we went back to Cosmopolitan to play. We were having a blast together playing the slots but we were also getting hungry and decided it was time to eat, and where else, a buffet! 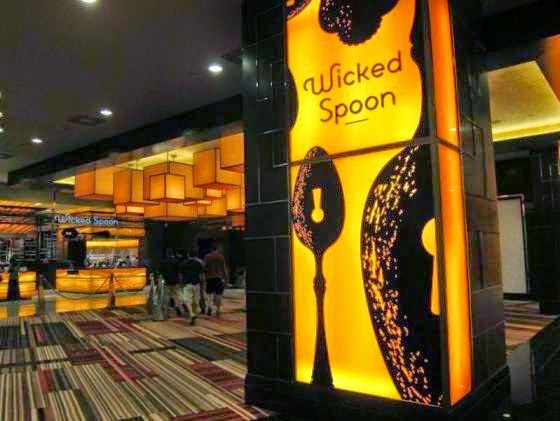 As mentioned I had already eaten at the Wicked Spoon earlier in the day so we went to Caesar's Palace and ate at the Bacchanal Buffet. This was around 7pm I believe so there was a line but we used the Platinum Total Reward line so didn't have to wait more then a couple minutes. 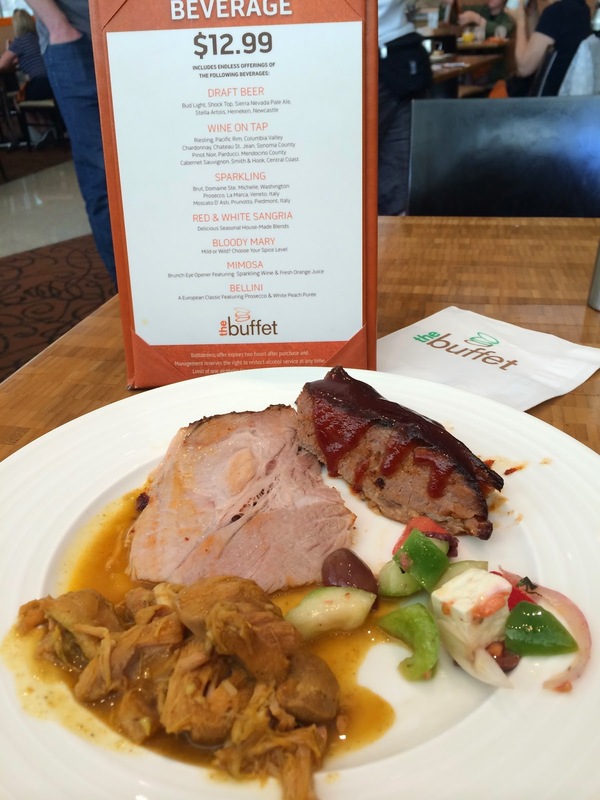 I already have a review and lots of photos of this buffet in my April Slot Fanatics trip report so I'll just show my main course and dessert. Fun times chatting with Albert over dinner, he's great company! After dinner Albert and I went our separate ways, he was off to play poker and I was meeting Gwen, Jeff, Roz, Larry (Monica and Aliyah were back in their room at MGM Grand) Jon, and Rich for drinks at the Seahorse Lounge at Caesar's. Above is Jeff, Gwen, Roz and Larry. Okay, substitute me for Gwen in the above photo. Note to Jeff, I'm not a armrest!!! Have I mentioned that Jeff and Roz are basically neighbors back home, and we have been known to get together at Santa Clara's Cheesecake Factory once or twice a year. Again sometimes just easier to get together in Vegas! 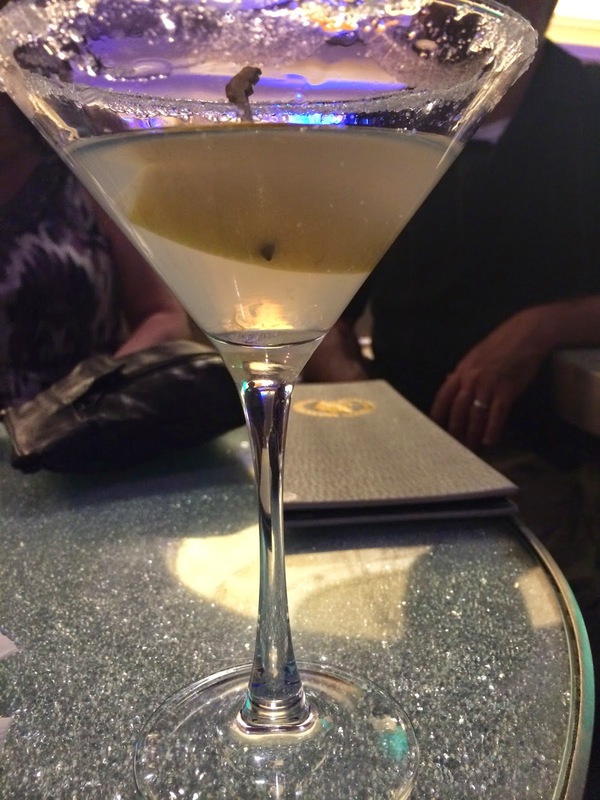 My first drink was a tasty lemon drop martini! 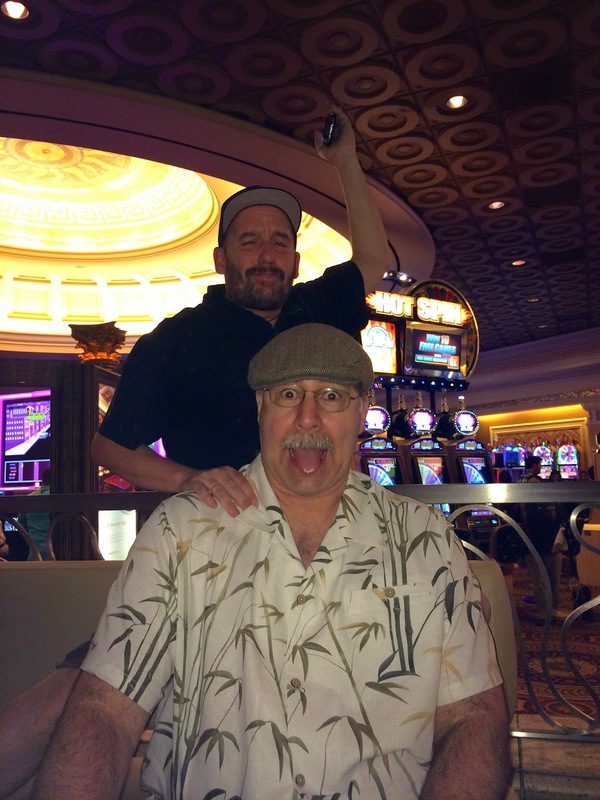 Jon and Jeff, doing what they do best, drinking and having a fun time in Vegas. I thought I had a photo of Rich, Jon's partner that I met this evening but while I finally did meet and briefly chat with him the photo has mysteriously disappeared. Spooky! Which means for those of you who know the running joke of Jon's partner being imaginary, that until I have a photo to post here he still doesn't exist, LOL! 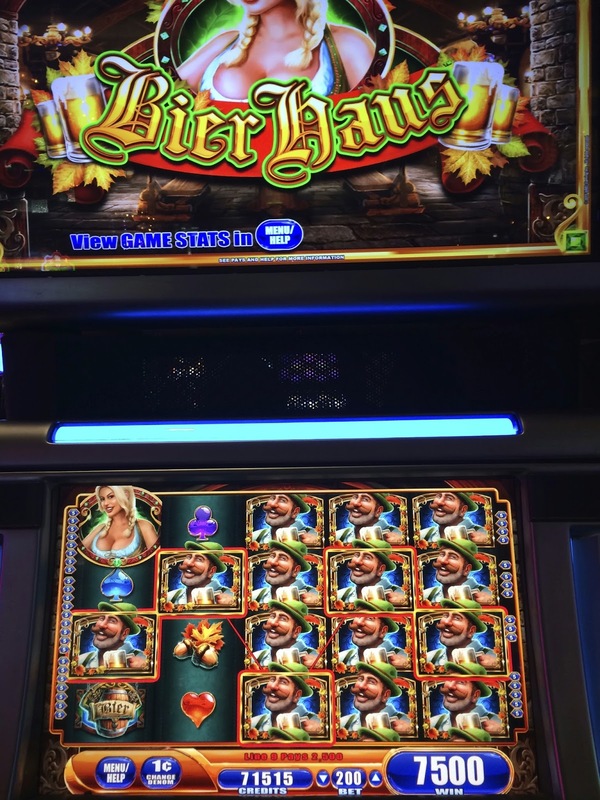 Had a decent hit with Bier Haus but failed to get the bonus. 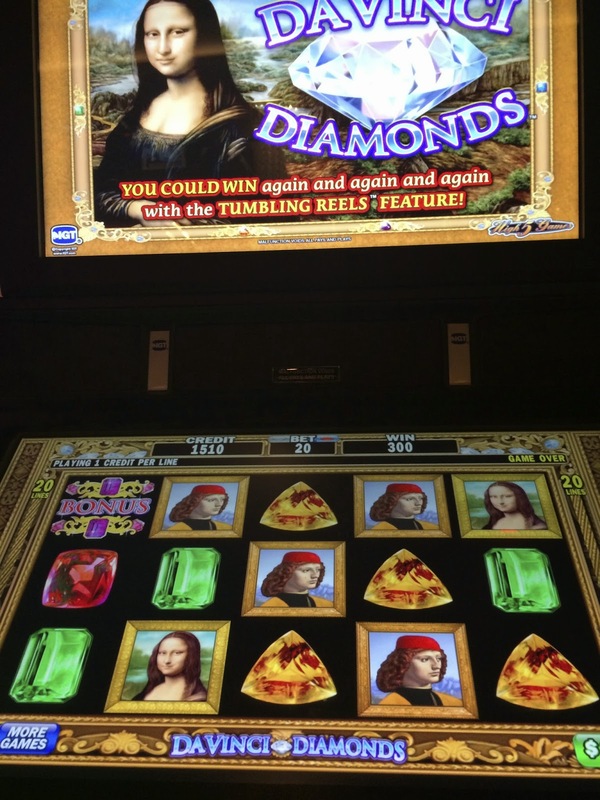 Remembered that I hadn't used my free play yet, so I went to the high limit room to visit my favorite $1 Davinci Diamonds slot and put a $50 in the slot and activated my free play. 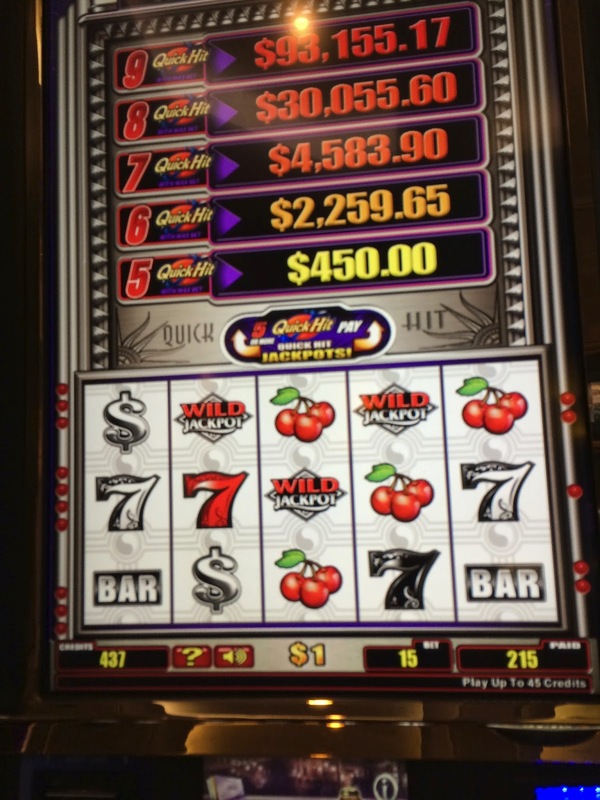 My biggest hit of the trip was on this slot for a $1000 and it didn't stop there, then it hit for $300! After the above two wins the bonus hit! 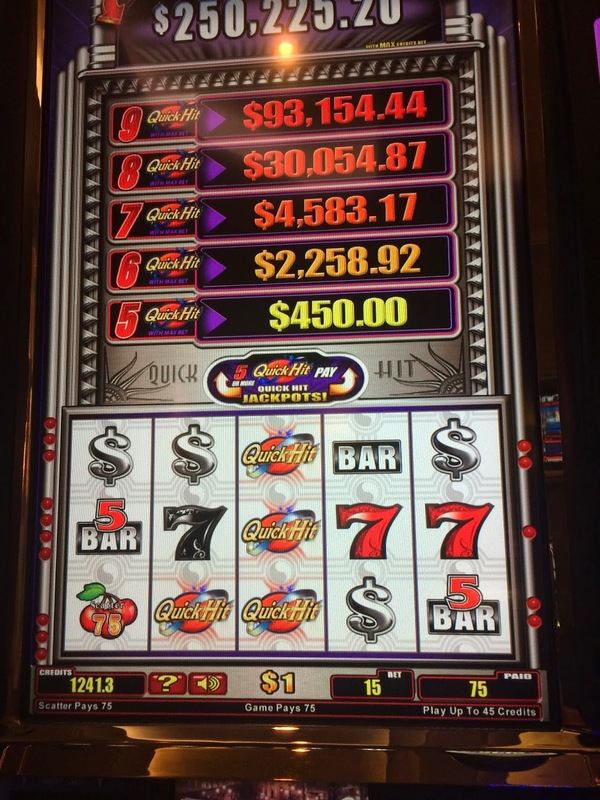 I cashed out with $2000.00! If you want to see the bonus here's the video of it. 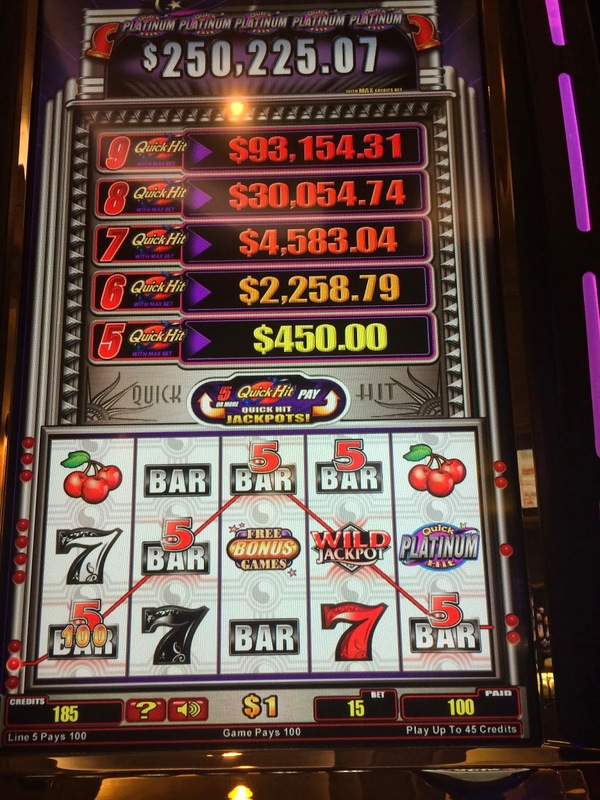 Cashing out at $2000 would have been the perfect time to quit for the night. 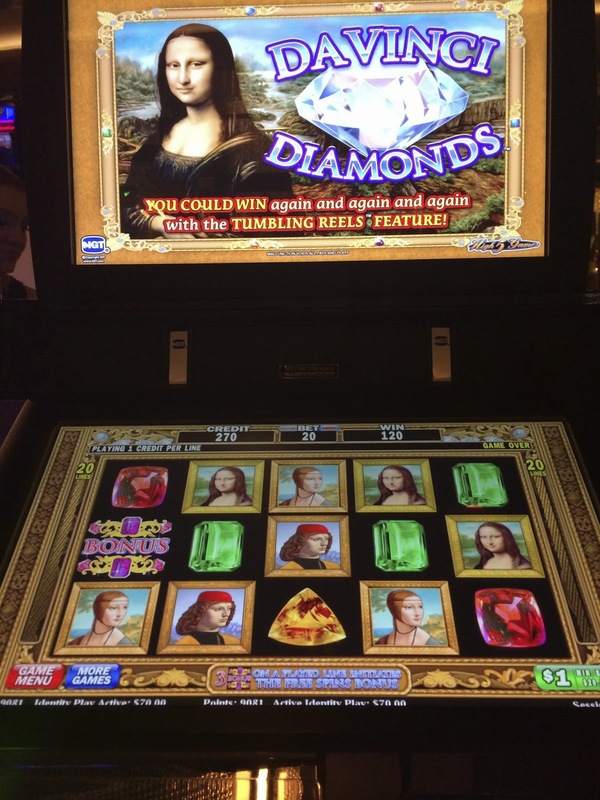 However this was the first night of the trip and I thought I was on a winning streak so I foolishly played $5 Pink Diamonds, $5 Wheel of Fortune, $1 Cleopatra II and $1 Diamond Queen and lost on them all. 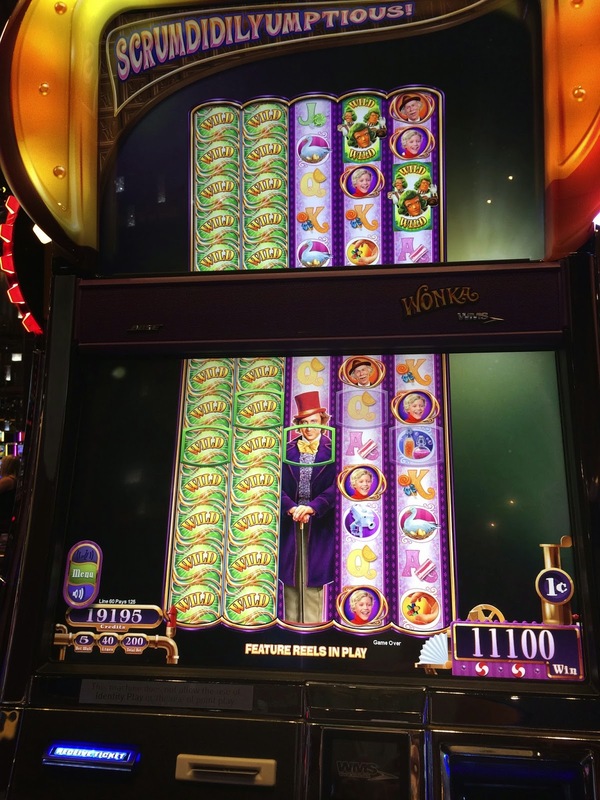 Then I went out of the HL room and lost on the penny slots. Yep, no photos of my losses. By the time I called it a night, I was only $100 ahead. 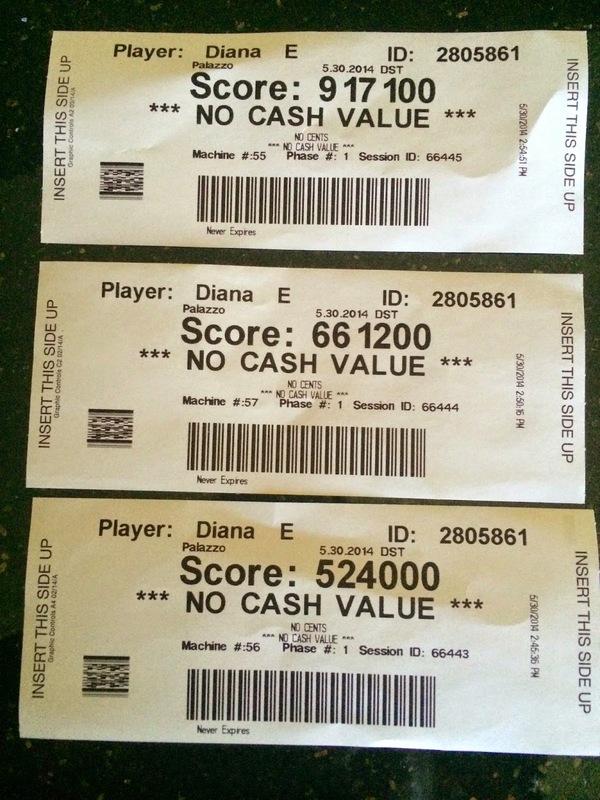 No, I do not have a gambling problem, I have a winning problem, LOL! My nighttime view from the 59th floor was great, but I could hear the boom boom boom from Drais nightclub. I guess from now on no more fountain view rooms if I stay from Thursday to Sunday at Cosmo. I will only have to hope that if I stay during a weekend their non-strip views don't get the noise. Yes, I'm getting old, there was a time years ago when I wouldn't have noticed the nightclub noise because my DH and I wouldn't be returning to our room until around 5am. I slept in late next morning since I wasn't able to get to much sleep. Today I was suppose to check in at MGM Grand so since I had a busy night planned I decided to get that out of the way and I grabbed a taxi. When I arrived they had a huge line at the normal registration but fortunately had a separate line for Platinum M-Life members that only had a few of us in it, though that changed quickly as the line behind me built up. Unfortunately after waiting for 30 minutes with no movement in the lines they finally let us know their computers were down for the count with no idea when they would be fixed. The man who talked to our group was very discouraging as he mentioned last year when this happened it took them days to get it fixed and he didn't know what to tell us about coming back later to try to check in. He did give us a strong suggestion to find something else to do for the next few hours. Discouraged since given my experience with M-Life's barely functioning website and past registration outages I have experienced at Mandalay Bay I left and went to Aria to get something to eat since I had not eaten today. 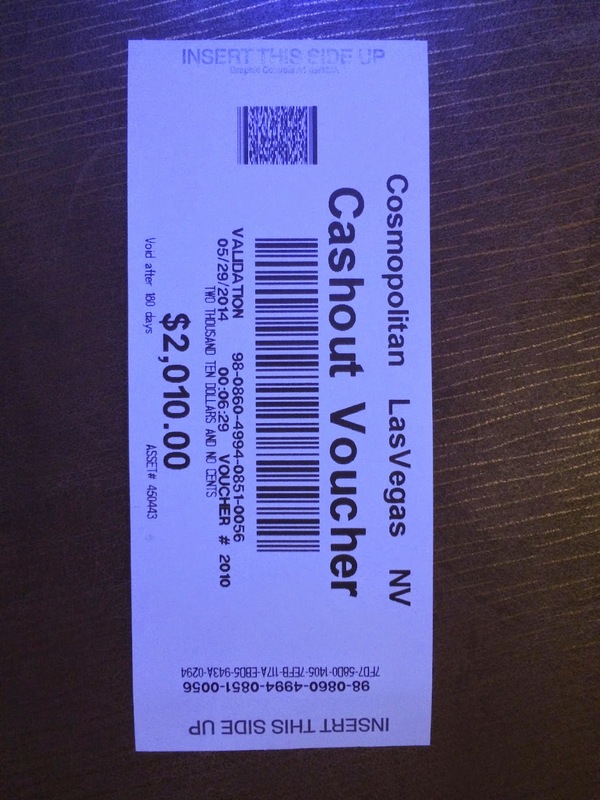 I had a myvegas reward for the lunch buffet that I used. Food was fine but I didn't eat very much of what was on these plates as I was concerned about checking in to MGM Grand. After my late lunch I walked over to Cosmopolitan and back to my room. I already knew I wasn't going to sleep at Cosmo this night due to the nightclub noise so I had to decide if I was going to check out a day early or keep the room but stay elsewhere and if so where? 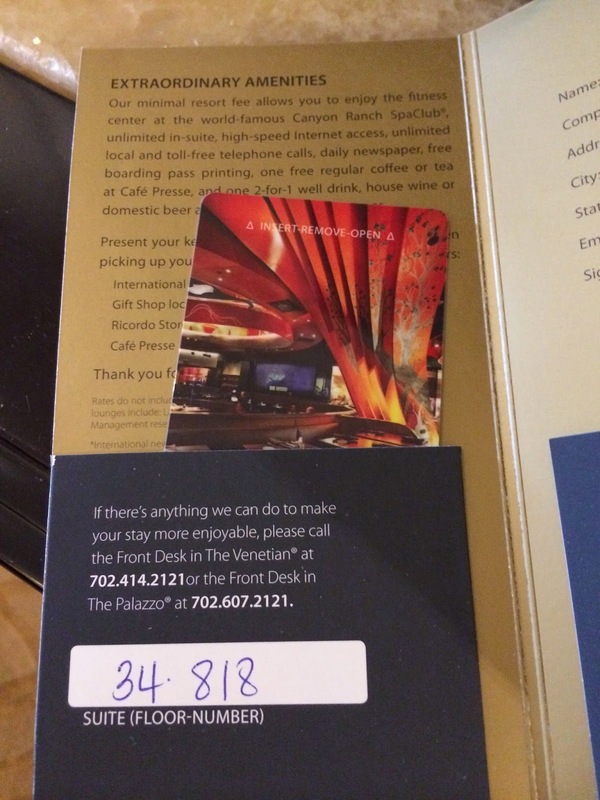 I had called back up and MGM Grand still didn't know when they could register anyone so since I had a early dinner and show tonight and didn't want to waste anymore time with worrying when I could get a room and if I would like it, I had them take down my information so they could cancel my reservation once their computers came back online. Next I sent a text to my host Brian at Venetian/Palazzo asking him if he could bring me in on one of my offers within the next hour. Originally I was avoiding staying there because I was going to low roll this trip, but oh well, it was time to stay where I'm comfortable. 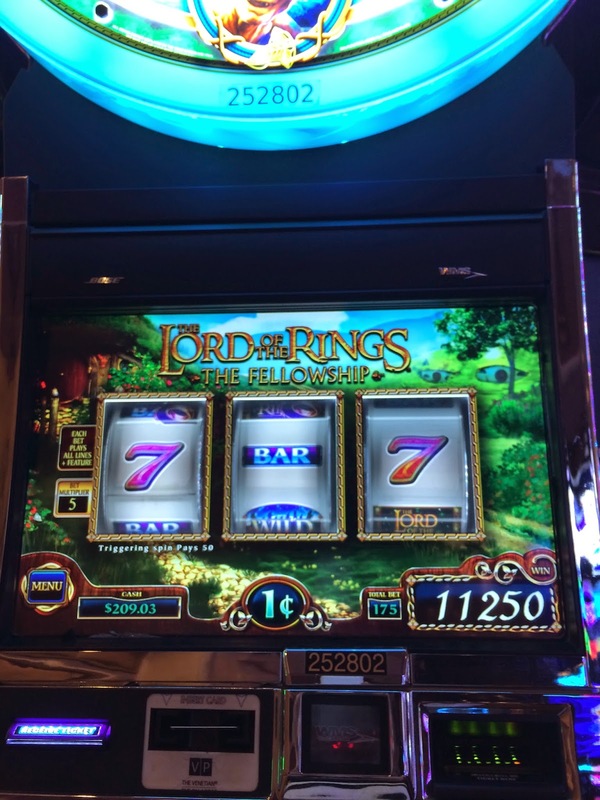 It turned out it was Brian's day off but he replied to my text within 5 minutes and arranged for me to come in 2 nights comped with free play and resort credit! Thanks Brian! It was Thursday and I had checked online and there was a convention that had made the rates at Cosmo zoom up to over $600 a night for their regular rooms and I had a desirable (if you don't mind nightclub noise) fountain view room on a high floor so I felt it was selfish to keep it and not use it so I called down to check out and told them again about the noise and why I was checking out early. Well, I got some one clueless who said there would be a $100 late check out fee on my comped room since it was now 3pm. My reply was she better check with a manager and have it waived as in that case I would just keep the room, instead of letting them rent it out for the big bucks to some other guest. After about 15 minutes of going back and forth on this I got someone with some common sense who decided to waive the late check out fee. I quickly packed up and was on my way to Palazzo within 30 minutes where VIP registration immediately took care of me and sent me off to my lovely QUIET room on the 34th floor. Since Terri and I were going to the 7:30 show at Rose.Rabbit. Lie we had a early dinner planned at Olives for 5pm, so I only had time to unpack, freshen up and gamble on a few slots before Terri picked me up. The gambling didn't go well, so I was glad to leave early for dinner. Terri and I know that to get the best table on Olives patio it's best to have a 5pm reservation which works out well when you are going to a show at 7 or 7:30 pm. Shortly after meeting Teresa, Terri and I were seated at a lovely center railing patio table. Above is my really yummy Cable Car cocktail. This was my first time trying this drink, but it won't be my last! 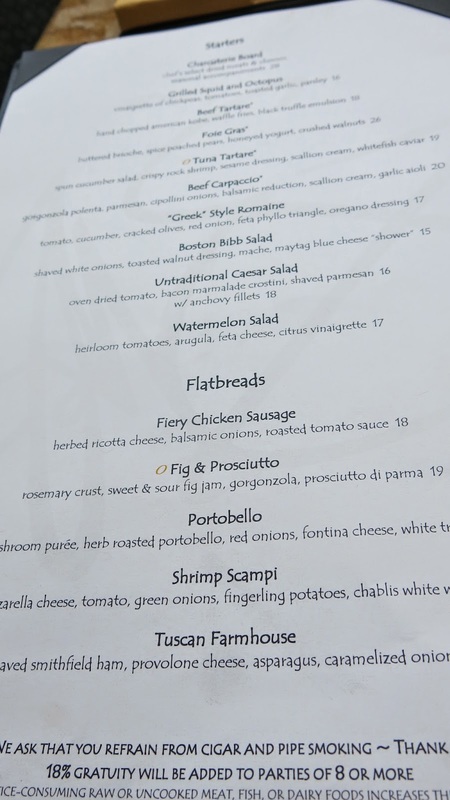 I took photos of the menu since some of the selections are different then what's currently published on Olives website. One of the best restaurant views in Las Vegas in my opinion! 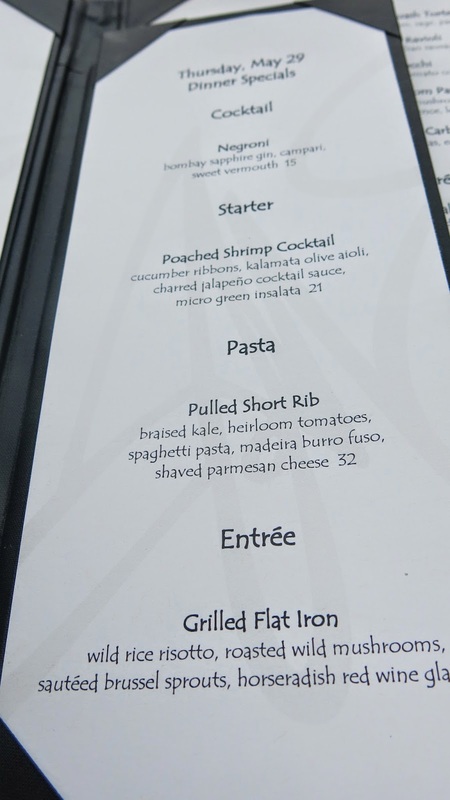 Terri ordered one of the dinner specials the Grilled Flat Iron and it was yummy. Served with wild rice risotto, roasted wild mushrooms and the best darn sautéed brussels sprouts with a horseradish red wine glaze. Of course I couldn't resist the Chilean Sea Bass with Garlicky Broccolini and served with Cannellini Beans and Sausage Cassoulet. The Sea Bass and Broccolini was delicious. I don't like white beans very much so personally didn't care for that part of the entree. Terri's Greek Salad was fantastic. Love the Phyllo triangle on top! My poached shrimp cocktail with cucumber ribbons was fresh, firm and tasty but in hindsight I wished I had ordered Terri's salad. 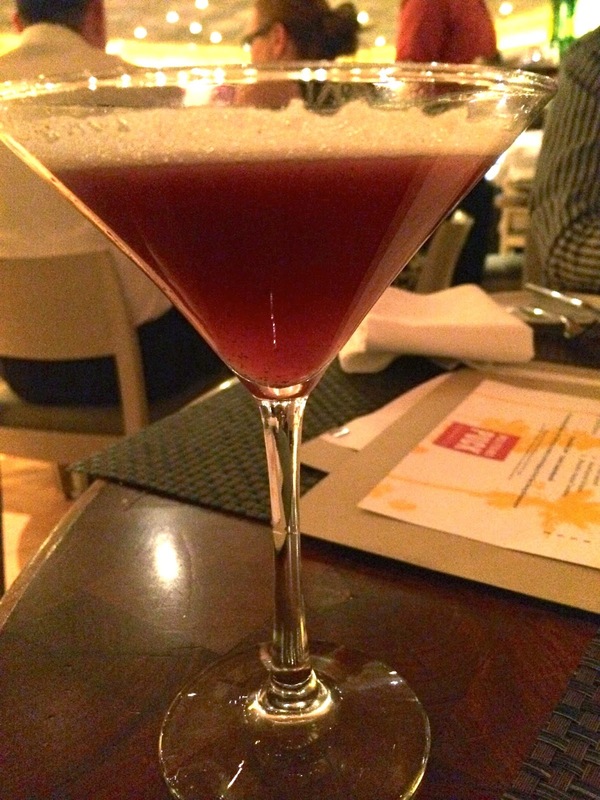 We skipped dessert and went straight over to Cosmopolitan after dinner. Above and below is just a few of the interesting objects scattered around Cosmo that we went by as we walked to Rose. Rabbit. Lie. 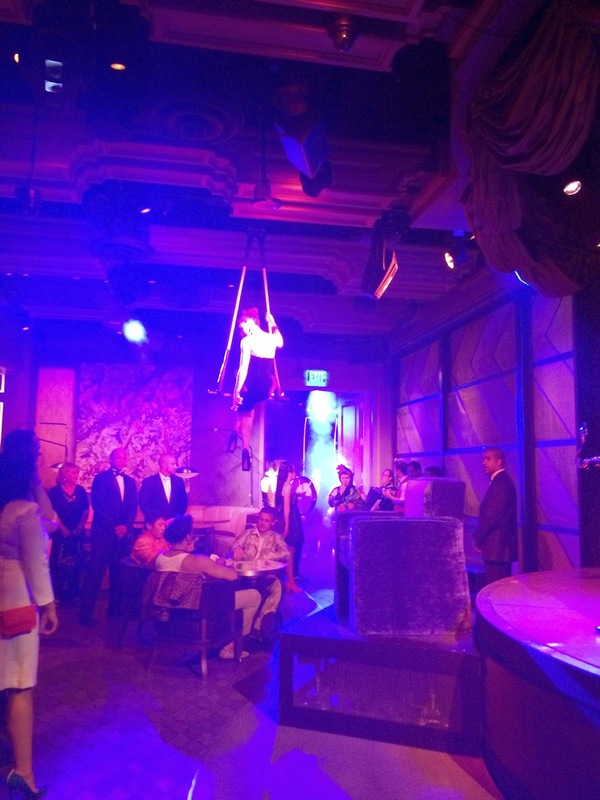 I had seen the first show of Vegas Nocturne at Rose. Rabbit. Lie in February with Boots and enjoyed it. Back then the first show was at 8pm, now it's 7:30pm. When Terri and I arrived we went right into the Music Room which has tables to dine at but is also a bar where most of the pre-show goes on and also has the entrance door to the showroom. Below are scenes from the pre-show which was enjoyable. I had missed a lot of this in February because Boots and I were eating dinner in the Library room. Some of the acts this time were the same as I had seen in February but there was also plenty of new material and acts I hadn't seen. I was glad they switch out some of their material and acts because I'm returning to see this again in July with my friend Claire and my Mom. Since Terri and I were in the first row we got popcorn when one of the acts passed it out though I didn't eat it, we also got covered a bit in some of the confetti and also splashed with some of the water from the man in the tub. Terri and I enjoyed the show with the exception of the sword swallower act which we found to be gross. After the show Terri drove me to Wynn where I played for a few minutes before returning to Palazzo. Terri and I wouldn't see each other again this trip but I'll spend more time with her on my next trip in June. I had left Cosmopolitan a bit ahead and had lots of play there. 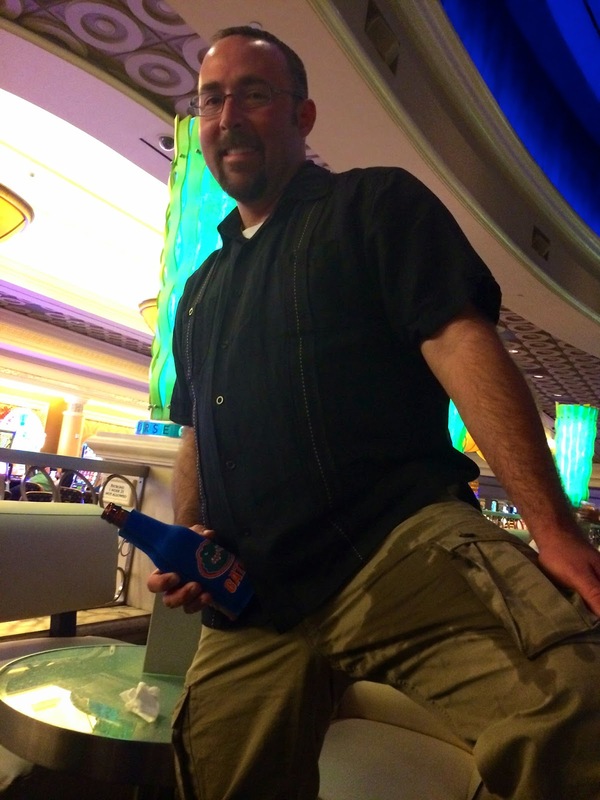 Unfortunately I was just losing at Venetian and Palazzo Thursday night despite a few fun bonuses. 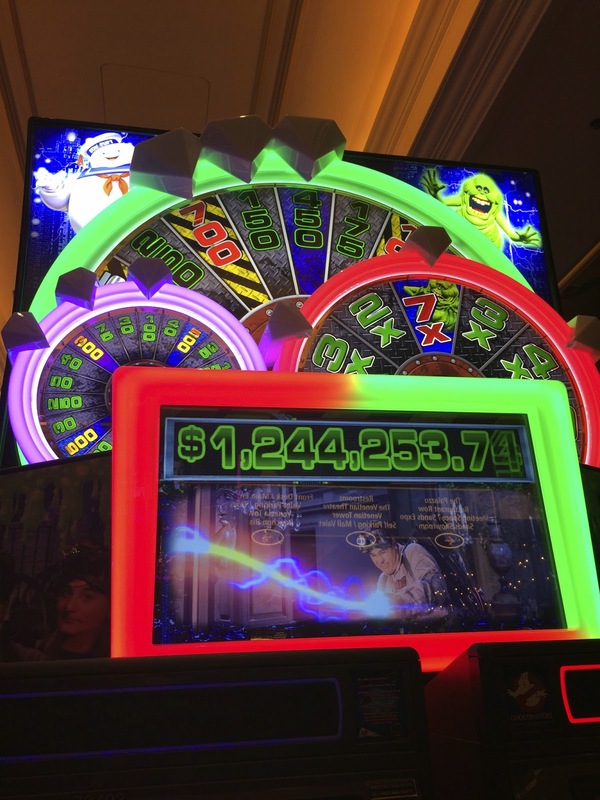 New Ghostbusters slot with three wheels like Twilight Zone but it was a fail, no bonus for me! 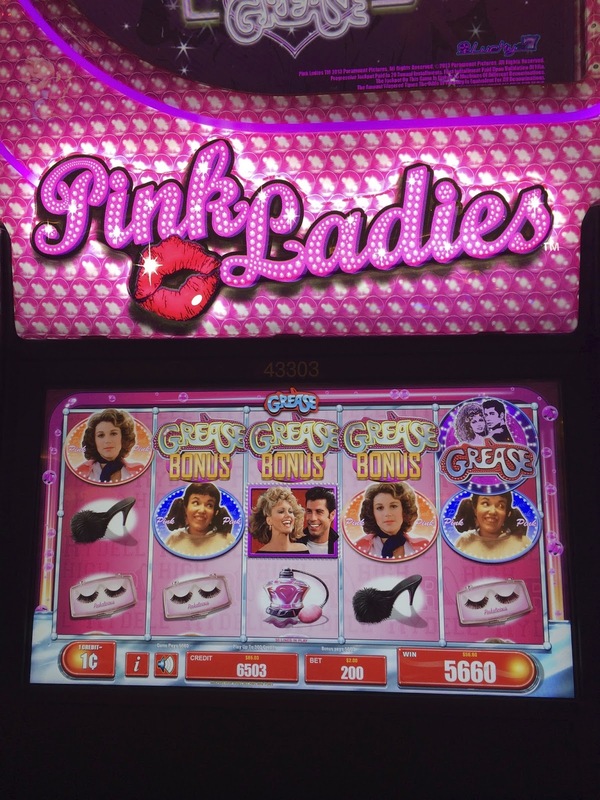 Grease Pink Ladies is a fun bonus even though in this case it didn't pay out much. 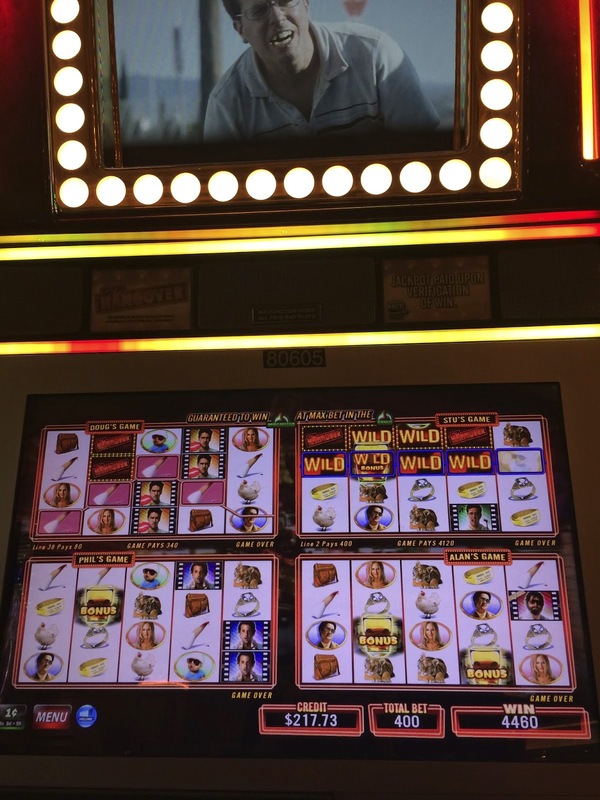 I had some mini bonuses on Jurassic Park but couldn't get the main bonus. Surprisingly Clue 2 this trip was giving me a lot of nice bonuses. I might end up liking this almost as much as my beloved original Clue slot. I had another issue other then nightclub noise and computer check in problems, my player's card kept telling me I was Grazie level and not Platinum even though my card was Platinum. I had questioned the player's card desk about this and they said I was Platinum and not to worry about it. 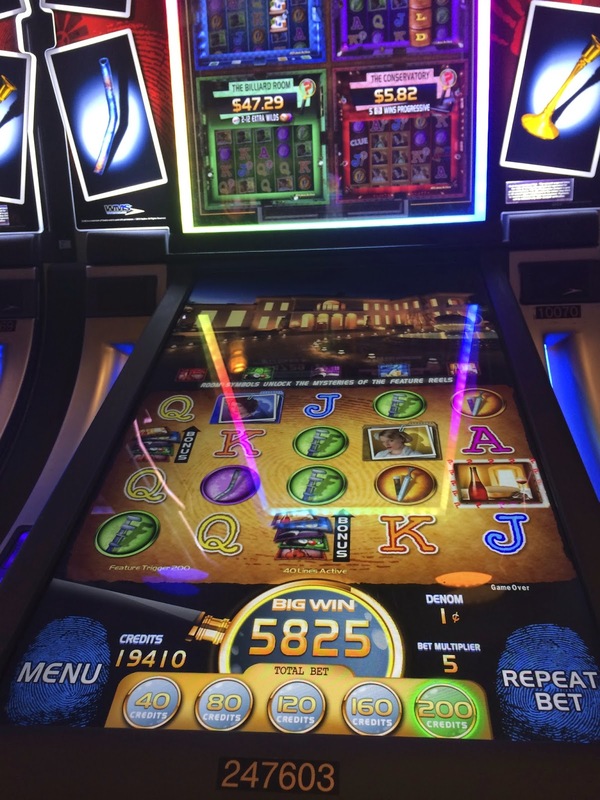 Later when it seemed to me my points were NOT racking up as fast as usual for the amount of play I was doing I questioned a slot attendant in the Palazzo HL room about it and showed her my screen and she was really clueless and said that Grazie level was just a advertisement. Really? I've been playing here for years and this is the first time it didn't welcome me with my player's card level and instead said the default level of the Grazie player's card level. 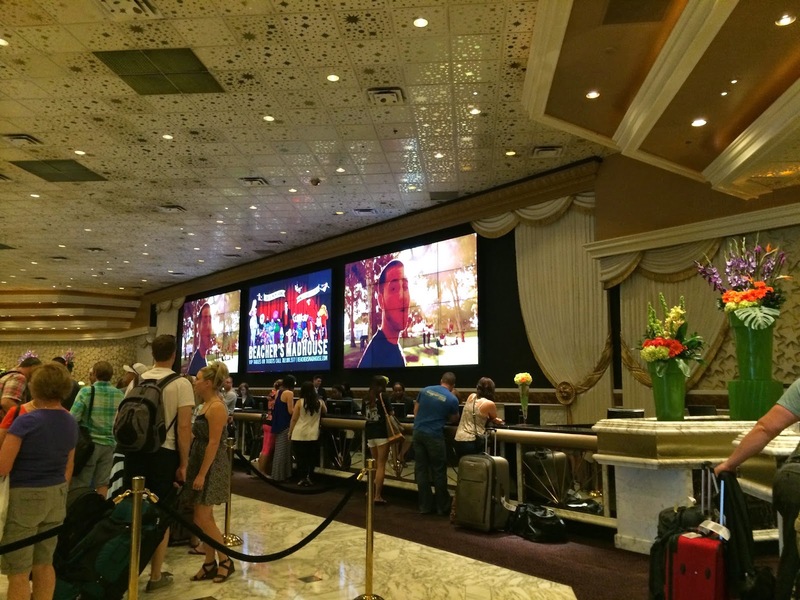 Casinos and their computers! Defeated both with the lack of wins, and not getting much in the way of points, I went back to my room and caught up on emails and Facebook. 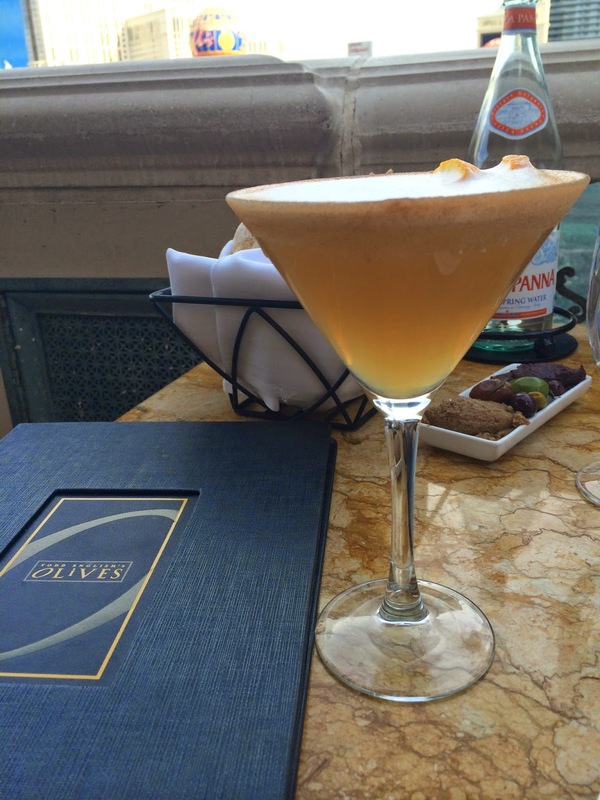 Next morning I slept in late and by the time I dragged myself out of my room it was lunch time which meant going to my favorite spot for lunch, Palazzo's Grand Lux. My eyes were a bit larger then my stomach when ordering so I could only finish half of these dishes but both were very good. Above is from the small plates menu and is their warm goat cheese salad with baby greens, apples and a touch of honey. The goat cheese is fried and served warm, really tasty! Below is Salmon three ways which I always enjoy. One filet is soy glazed with mushrooms, the other is horseradish crusted with asparagus and the last is almond ginger and green beans! After eating I marched myself over to the Grazie desk at Palazzo and a small miracle I got a gentlemen I had never seen at the desk before helping me who knew what he was doing. 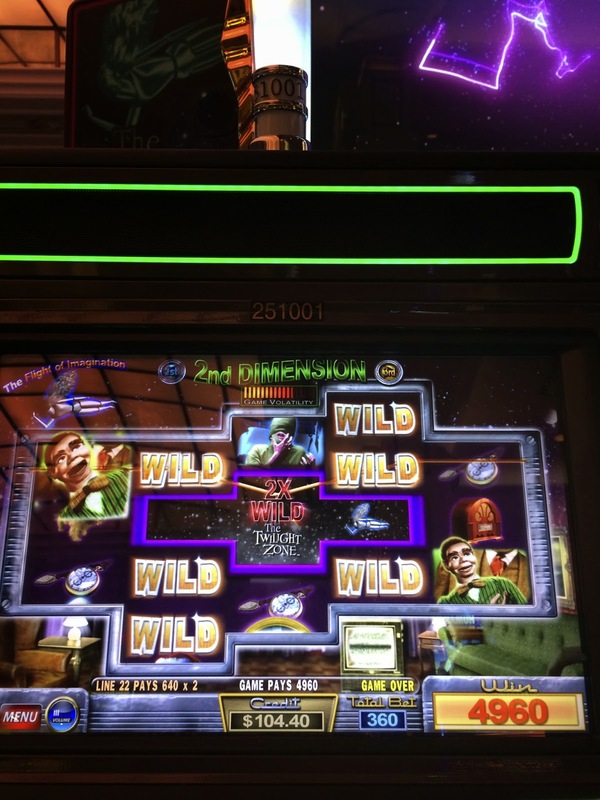 He went and inserted my card in the slots and sure enough he agreed it wasn't registering my level correctly and he returned to the computers did some stuff and all of a sudden my card is working correctly. I've never saw him at the desk on past trips, nor again on this trip so now I'm guessing I lucked into getting a manager to help me. Unfortunately I never got the points I was entitled to from the previous day and it was obvious to me as I started playing and watching my point gain after the correction that it did make a big difference being set previously to Grazie instead of Platinum level. Happy Days were here again though as I was winning again. Not any big wins, but lots of bonuses and hits to keep me ahead the whole day. 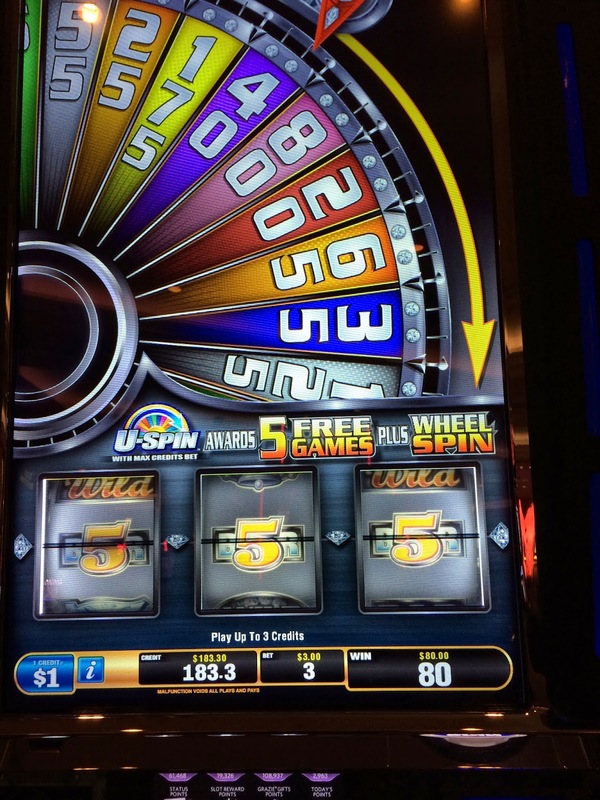 I had some nice hits on $1 Quick Hits and a few bonuses but I picked poorly and didn't get many spins on the bonuses. While I was at the players club desk earlier I was reminded that there was a daily slot tournament and that I had missed out on it yesterday (darn it)! I already had enough points this afternoon for three entries into the daily tournament which is the max amount allowed. 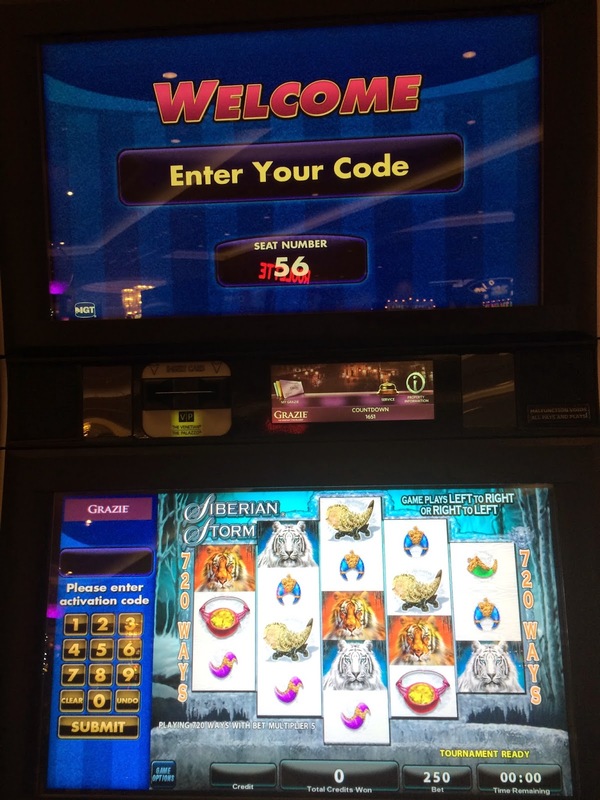 They no longer make you qualify and then play in a tournament with other people, instead you play on the slots near the player's club inputing a code they give you at the player's club desk and start your session when you are ready and it's convenient for you, as long as it's before the cut off time. 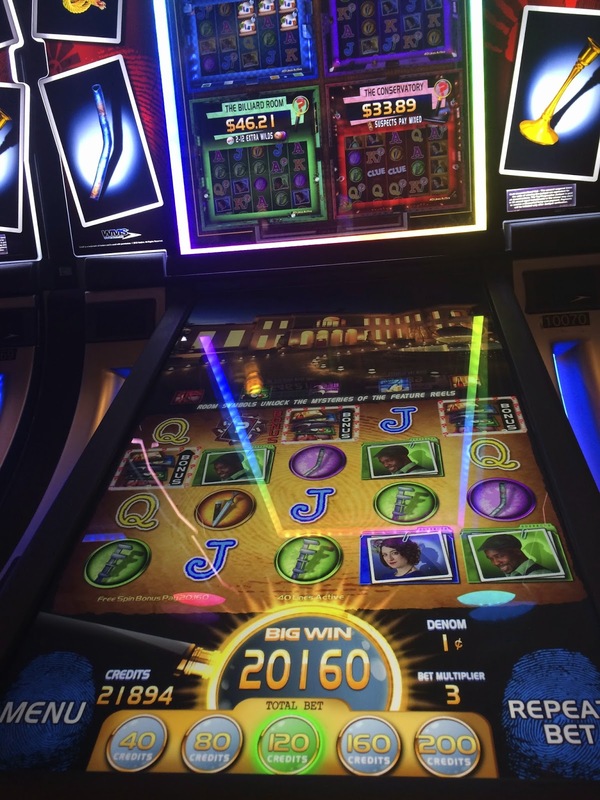 At 6pm you find how much you won by just putting your player's club card in a slot to see what free play shows up, though they also have the list of winners and their places on a monitor at the Grazie desk. 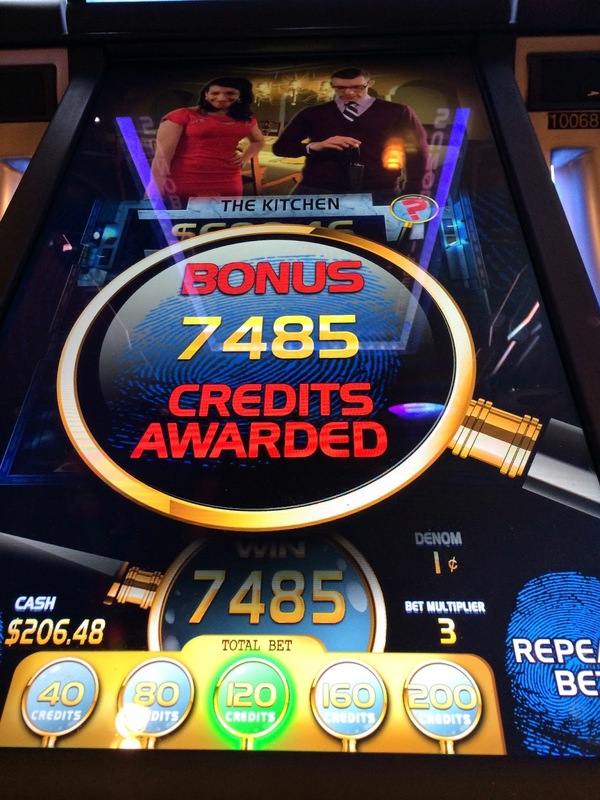 I believe I was told that even last place gets $20 free play and 1st place gets $500 free play. I did my three sessions at 3:30pm and my last one where I got 917,100 points put me in first place as during the individual tournament sessions it tells you where you are in relation to the players before you. 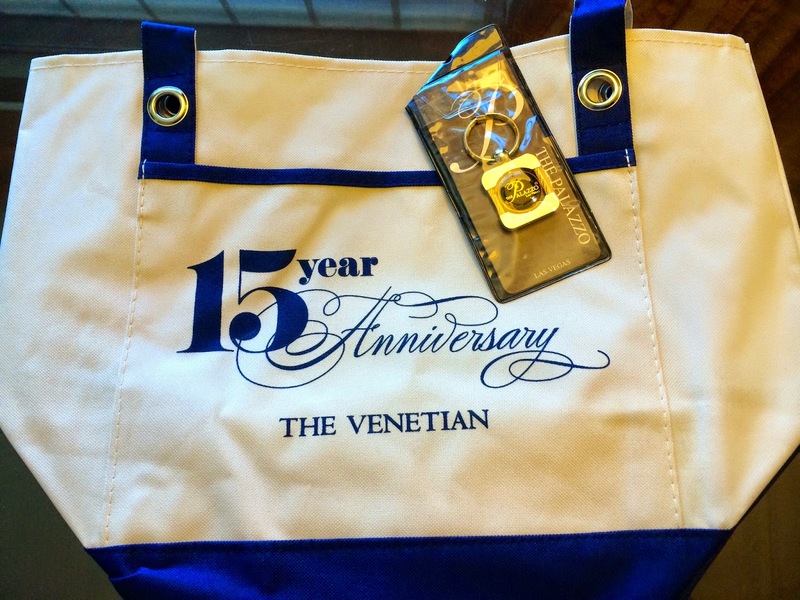 When I was given my tournament codes they also gave me the gift for their 15th year anniversary celebration which was the tote bag below and the key chain. My son liked the key chain and is using it. 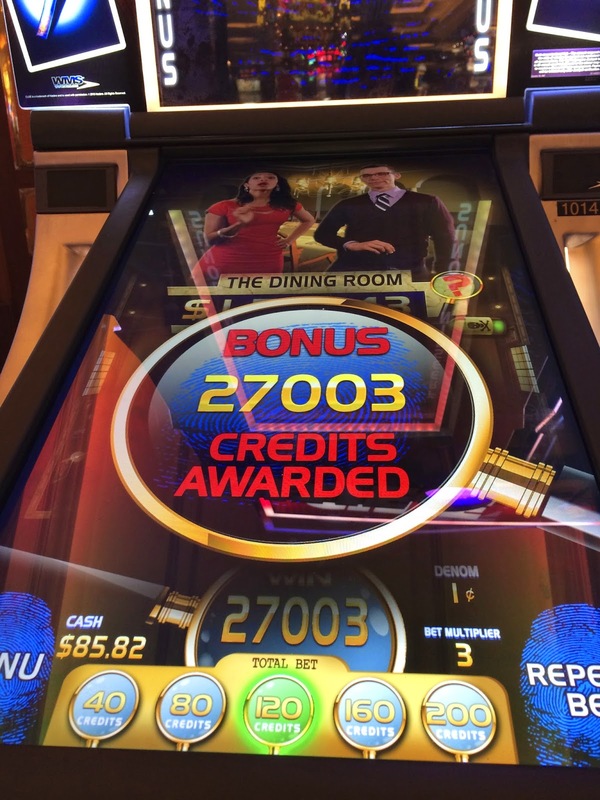 Feeling good about presently being in 1st place and having a good chance of winning the $500 free play, I continued to play lots of slots until dinner and managed to continue to stay ahead. 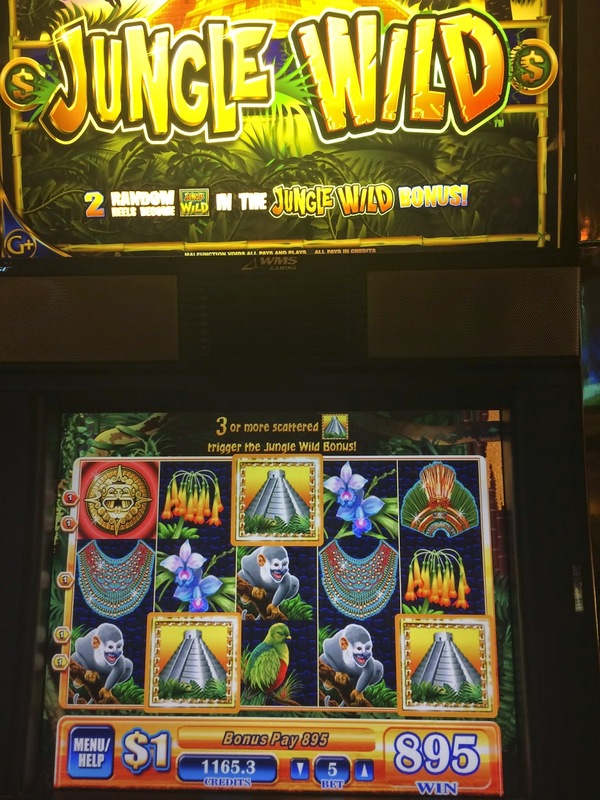 I had a quick and fun bonus with $1 Jungle Wild. Video below if you want to see it. 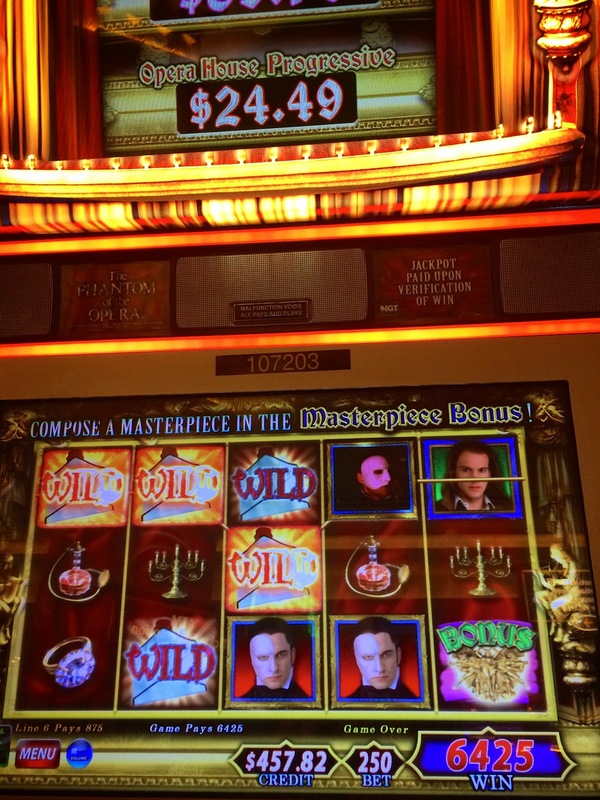 I couldn't resist trying Phantom of the Opera but while it gave me some mini bonuses, I couldn't get the main bonus this trip. 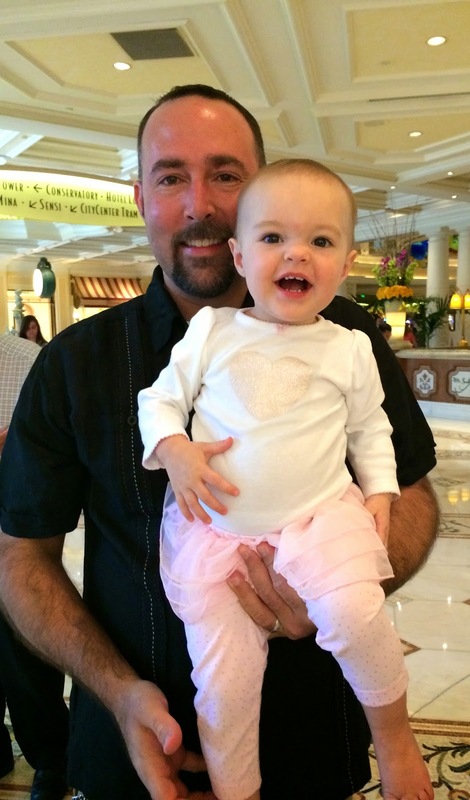 Around 5:30pm I headed out to MGM Grand to meet Gwen and the Gator family for dinner. 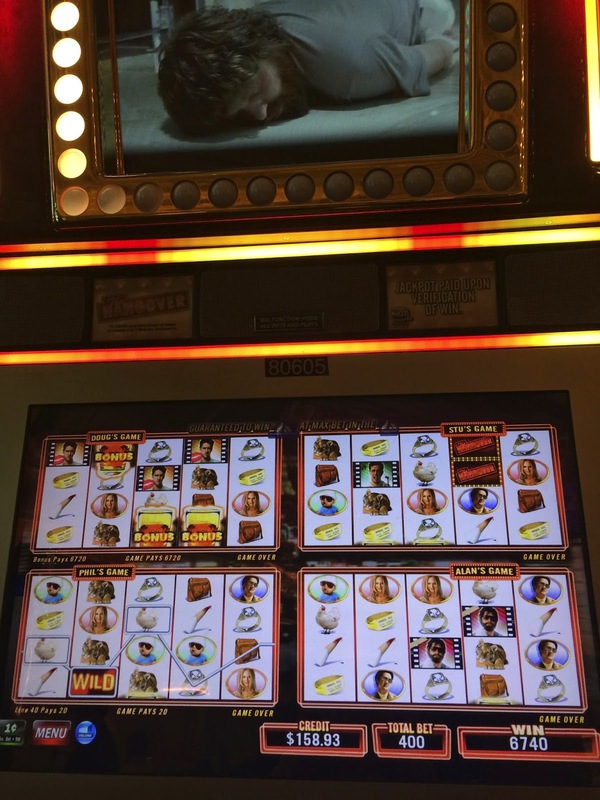 I also had some fun playing the Titanic slot with Gwen, but I never could get the main bonus while Gwen had quite a few, though they didn't pay that much. Had a quick but fun bonus on Family Guy before going into dinner. 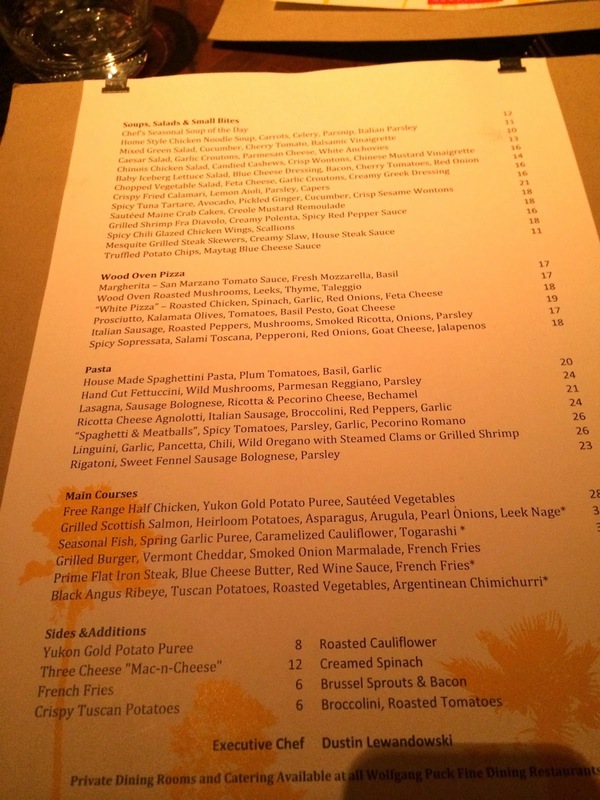 Dinner tonight was at Wolfgang Puck's Bar and Grill and this was my first time eating there. Family photo of Auntie Gwen, Mommy Monica, Daddy Larry and adorable Aliyah. Menus for those who might want to consider eating here. My Blackberry Anejo Cocktail recommended by our server had tequila, lime juice, blackberry puree and other wonderful things mixed in and was lovely. I would order this again! Some photos of the kitchen and restaurant in case you haven't been here. Both Monica and Gwen ordered pasta dishes. I believe the pasta dish below was Gwen's but they brought her the wrong type of pasta so she had to wait while they corrected their error. There was a Halibut special that evening that I ordered. It was good but not the best I've had. The stand out dish for me for the evening was the side of Broccolini I ordered with tomatoes, garlic and cheese. It was so flavorful and fresh. 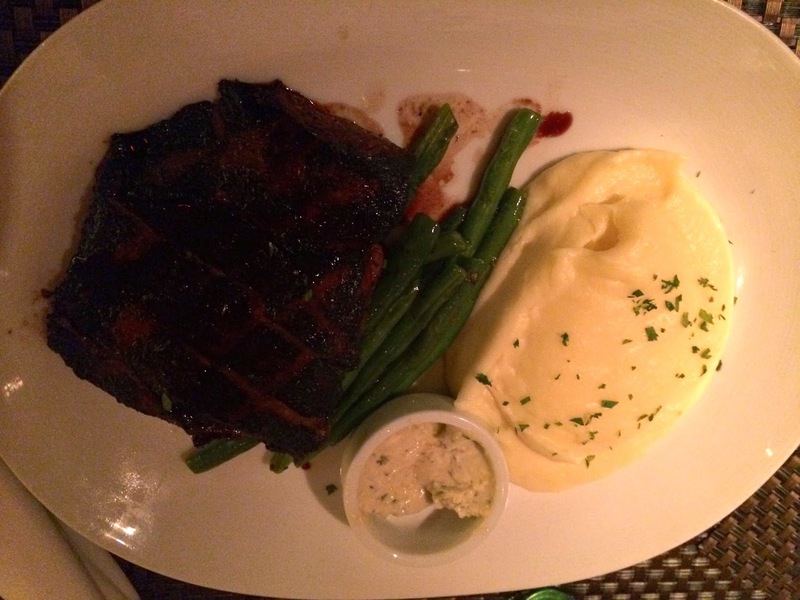 Larry ordered and enjoyed the Flat Iron Steak. 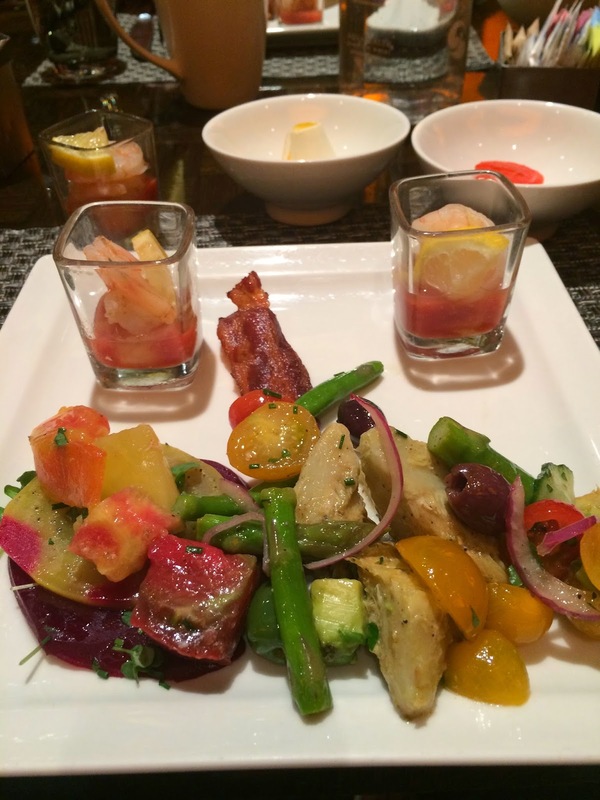 I'm a fan of Wolfgang Puck restaurants, I consider Cut at Palazzo to be one of the best restaurants on the strip and I also like Postrio at Venetian. 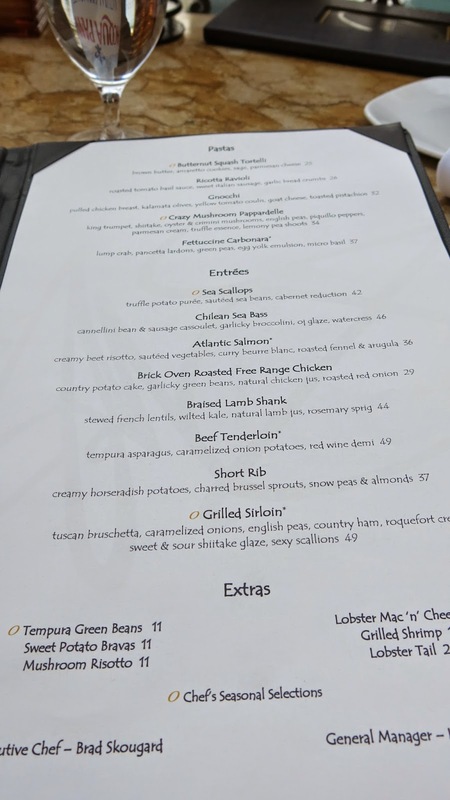 While our food and service was fine there wasn't anything that special about our meal that would find me recommending it or returning to it given all the outstanding restaurants on the strip. After dinner it was time for Monica and Aliyah to return to their room and I needed to head back to Palazzo to meet up with Albert. 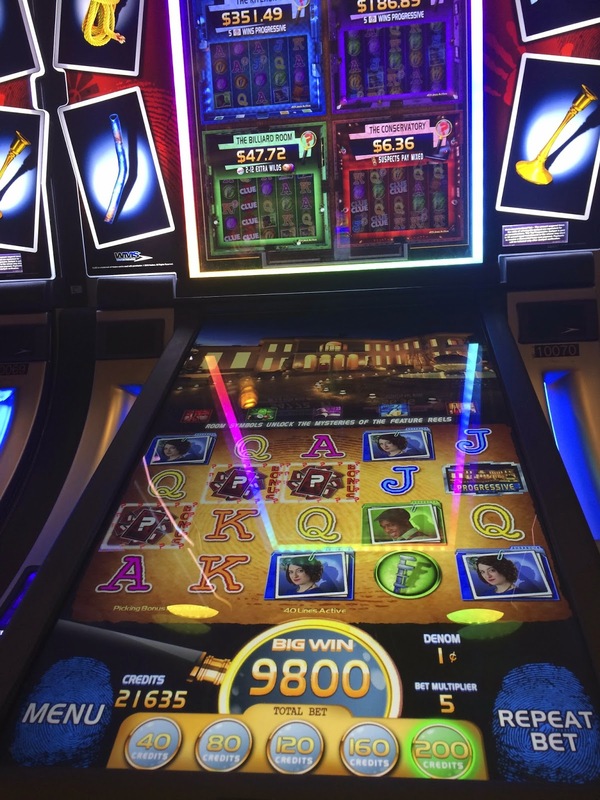 I was eager to find out if I had placed first in the daily slot tournament but when I put my player's card in the first slot I came to I had won $200 free play and and not the $500 so some last minute tournament players knocked me out of the first couple places. I think I might have come in 3rd but I'm not sure, still $200 free play is a nice prize! That's the two of us in the Palazzo VIP lounge before we head out to play slots together. I had some very nice hits and bonuses tonight, but the company made it extra special. 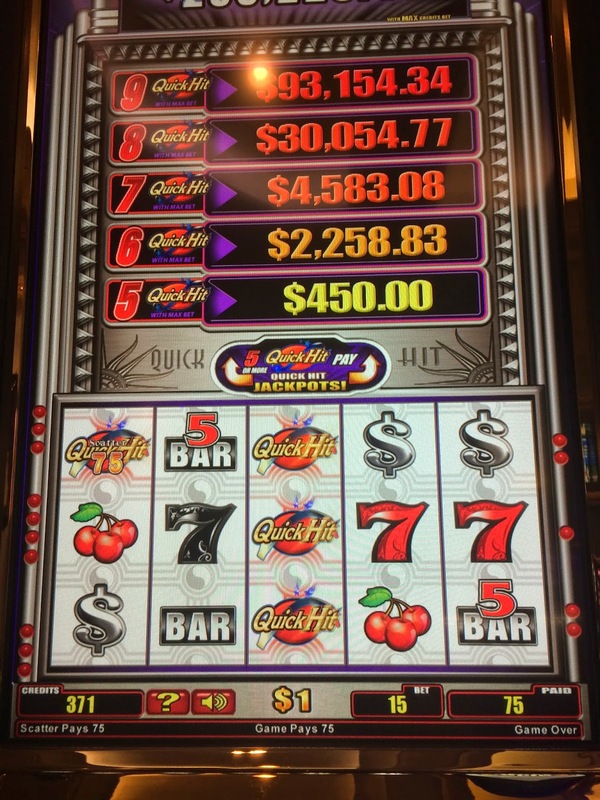 Last Top Gun Slot that I know of is still at Venetian and I try to play it each trip since a couple years ago it gave me a hand pay on a fly by bonus. 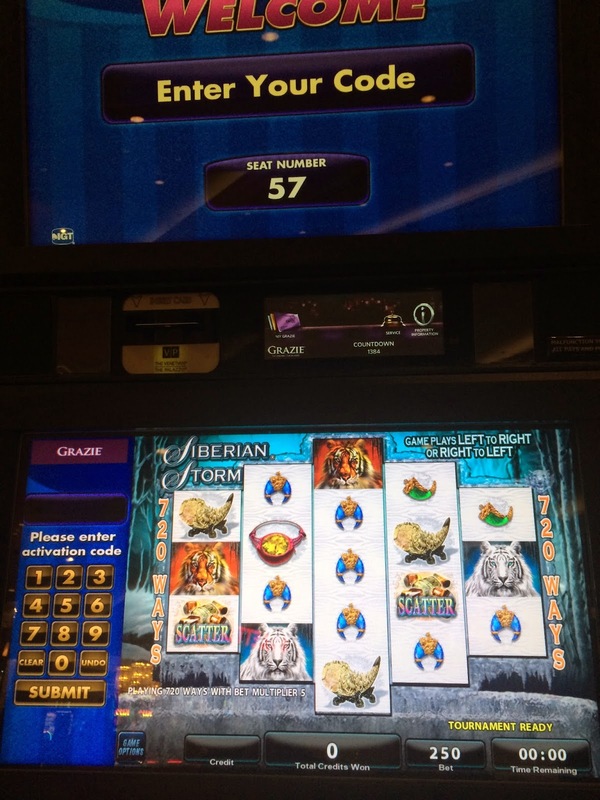 After Albert left to return to Caesar's Palace, I played for a bit longer and continued to win though no big jackpots were hit. After about a hour though I went back to the room to chat with my husband, catch up online and start packing a few things up as this was my last night. The next morning as I headed out to meet Gwen for brunch at Four Season's Veranda restaurant I noticed they had put a Mercedes in the middle of the Palazzo casino floor. 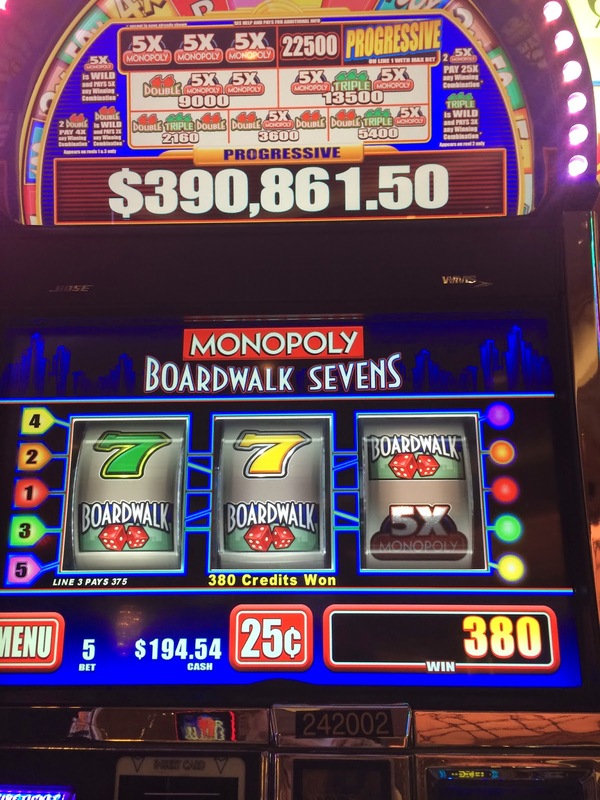 I was later to learn this was one of the main prizes (others include 50k cash, trips, free play, etc…) for a new Monopoly casino game promotion that started the next day on June 1st and would end on July 31st. 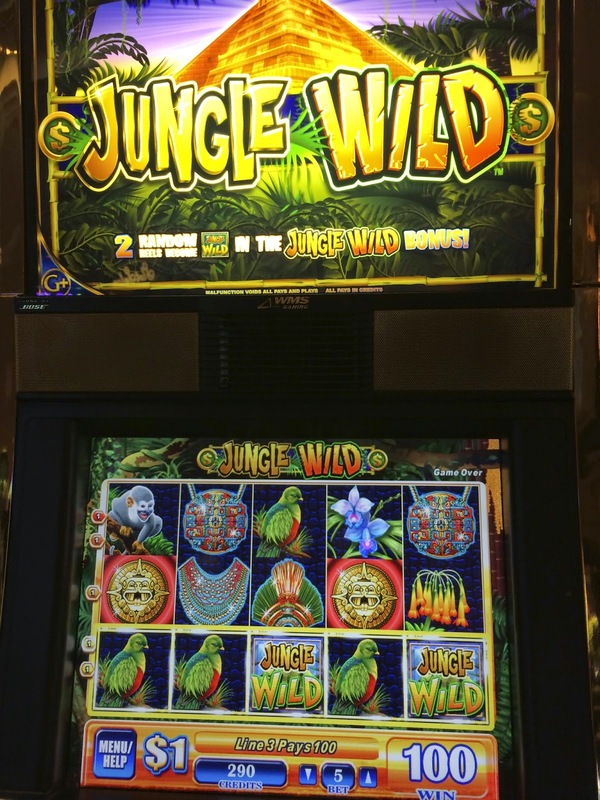 During this promotion the daily slot tournament will not take place. The taxi ride to Four Seasons which is located at Mandalay Bay was uneventful and Gwen was waiting for me outside Veranda when I arrived. We were asked if we wanted to sit outside on their patio near the pool area or inside and Gwen knowing how much I love air-conditioning requested a inside table. While I ordered the Mahi Mahi tacos for my meal, the star of the show is the weekend brunch. Below are photos of the brunch set up and food. 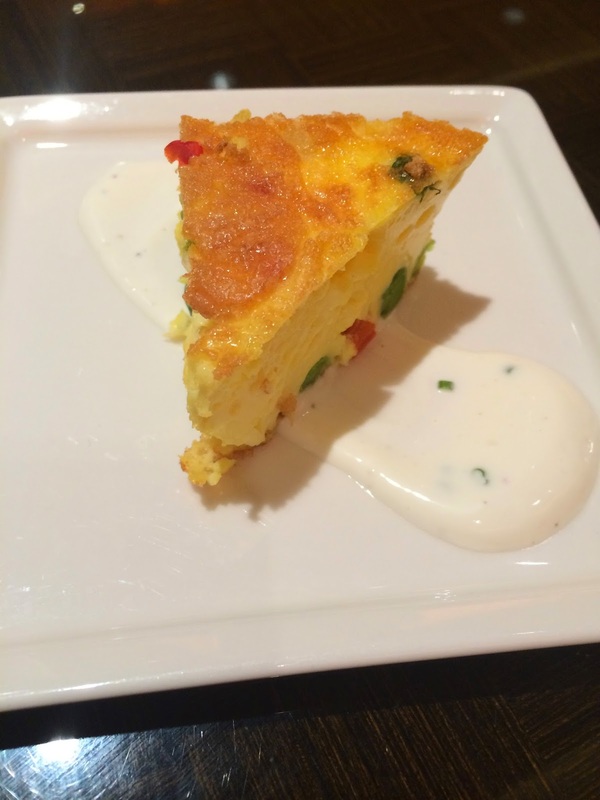 Brunch is $39.00 and includes Juice, Coffee and Tea. 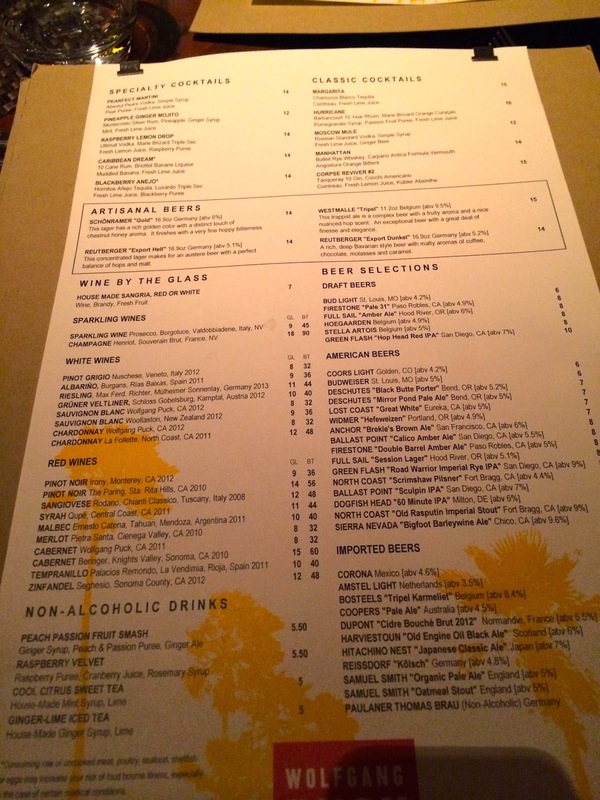 They also have a unlimited Ultimate Bloody Mary Bar so if you add that to your Brunch it's $51.00. For those with children the price for Brunch is $16.00. The Brunch is set up on the bar area of the restaurant and then tables set up around the walls where you first enter the dining room. 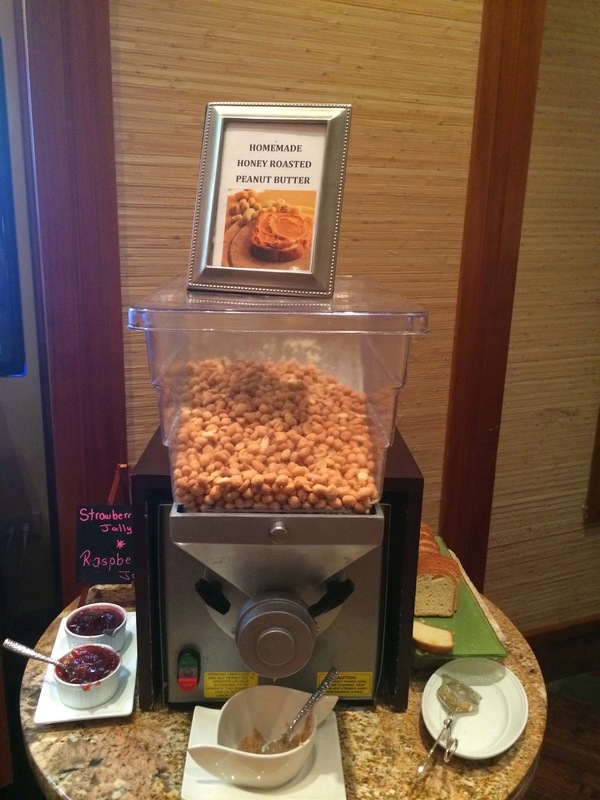 Only Brunch I know of on the strip that offers home made peanut butter! The desserts are very fresh, you can watch most made right in front of you. While I didn't order the Brunch this time Gwen enjoyed it a lot and it's one of her favorites! Having already checked out of MGM Grand before our Brunch, Gwen collected her suitcase that she had checked in briefly at Four Seasons and we headed back to Palazzo as both of our flights would not leave for about 5 more hours so she was going to store her luggage in my suite as I had a 5pm check out time. Normally I don't play the day I leave Vegas but I decided to join Gwen in low rolling today in the Palazzo casino and we had a blast playing Clue 2. I was still winning and getting lots of bonuses on Clue 2 while Gwen wasn't so lucky. After Clue 2 we both went over to Monopoly Boardwalk Sevens and while I had a few bonuses and made a few dollars on it, I quickly got bored and returned to Clue 2. 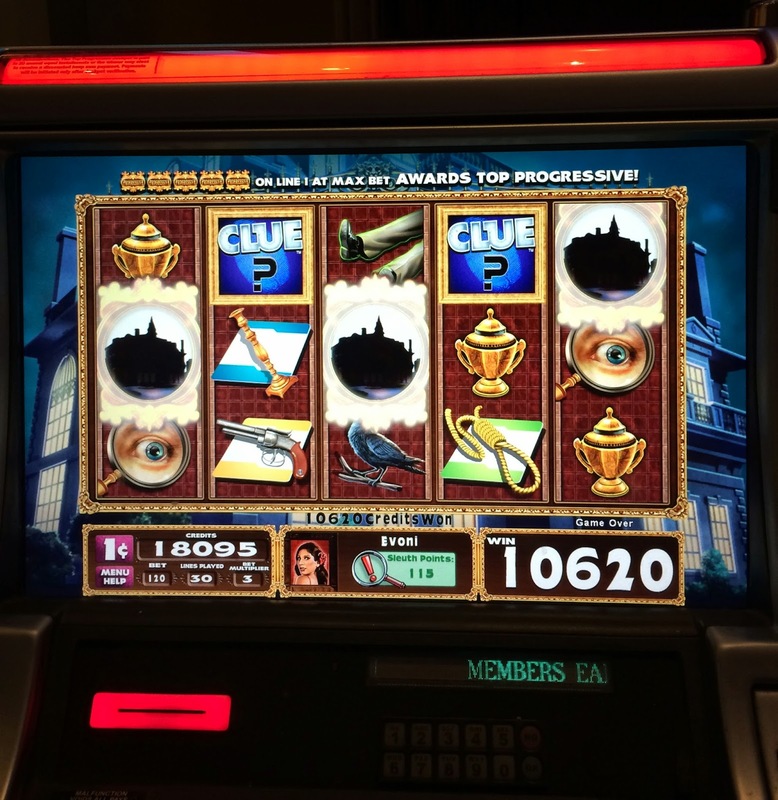 I was happy that I went back to Clue 2 because I had a few more good bonuses on it low rolling at $1.20 a spin. The Palazzo casino wasn't giving Gwen any wins so she returned to my room where I shortly joined her and it wasn't long before it was time to meet our limo and go to the airport. This is not the Palazzo limo that took Gwen and I to the airport, but while we were waiting for our limo to pick us up this long Hummer limo pulled up with a bunch of young children hanging out the window. Only in Vegas! Hi Diana - Thanks for the great report and glad you had fun. I love, love that goat cheese salad at Grand Lux. Have it every time. Thanks for the pics of the Veranda brunch, that's still on my "to do" list. 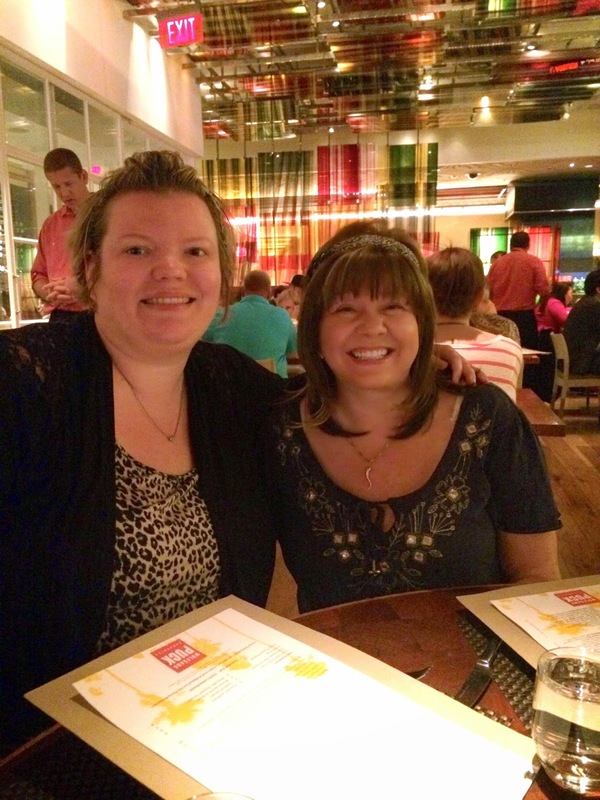 We had a great time on our May trip as well, and you were right, we loved the Aria Sky Suites. 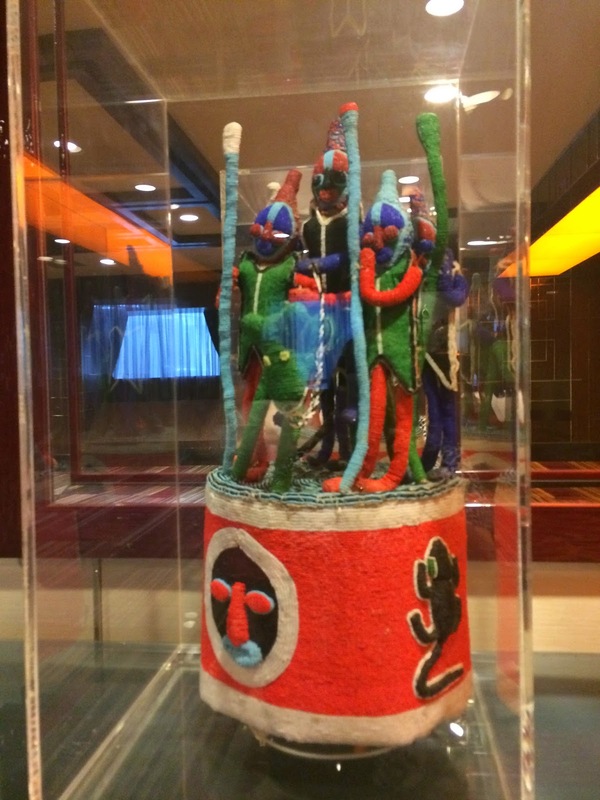 Also had stayed on night at the Cosmo for the first time (the Thurs. before your stay) and enjoyed that as well. 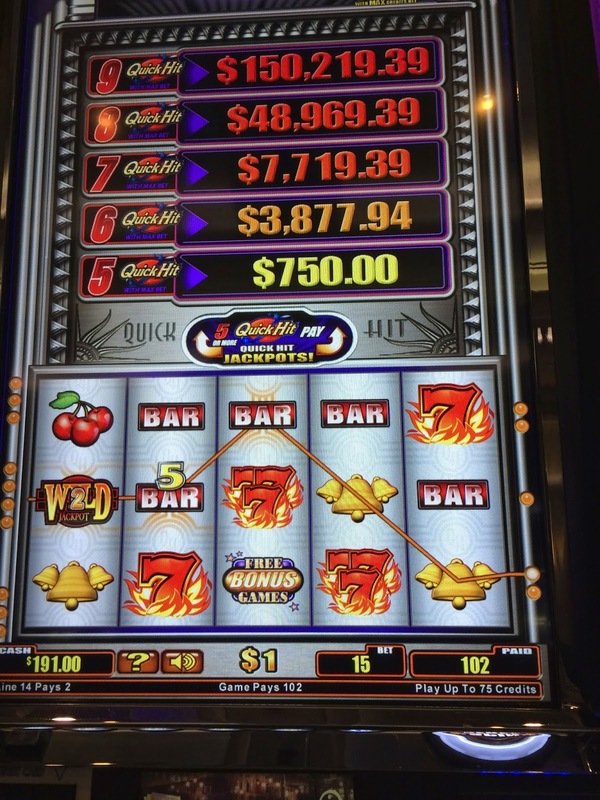 That was my best night on the trip as far as the slots. They were quick to send out great offers when I got home, but I think I'd wait until the weather was cooler to enjoy the balcony and also the loud pools would be closed. Seems like more and more we're having to give up nice views for rooms without noise -sigh. Enjoy your trip this week and good luck! 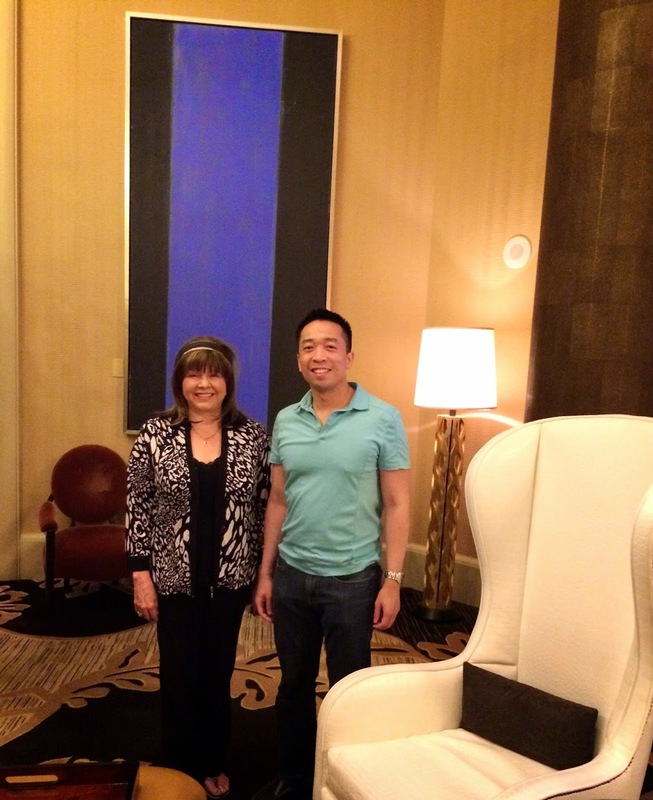 Cheri, it's great to hear you loved the Aria Sky Suites and had a wonderful trip. I'm eating again at Veranda next Saturday in the morning so will actually order their buffet brunch this next visit. I can't pass up the homemade peanut butter, LOL! Thanks Albert! I hope we might see each other in Vegas during Thanksgiving though we'll both be busy with our families. :) Thanks for the positive thoughts on the nice quiet room! 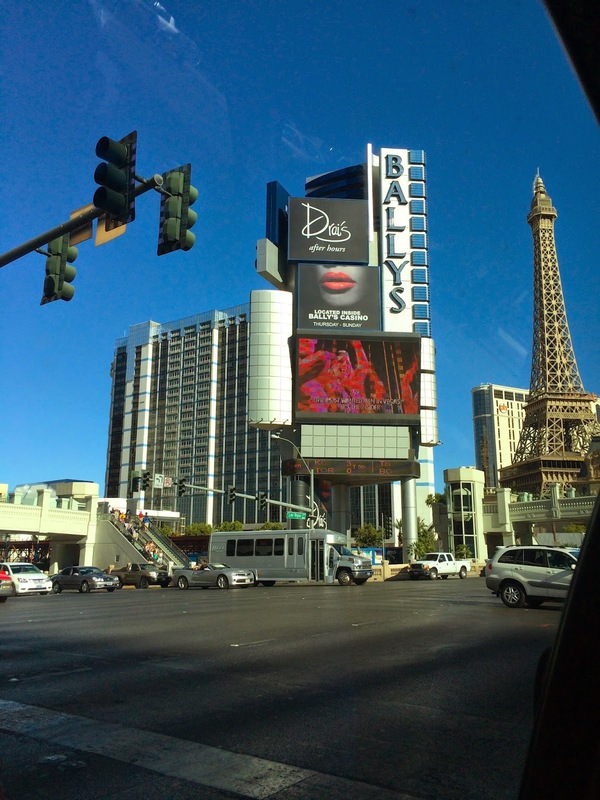 I should be fine at Palazzo but a bit worried about Mandalay Bay, LOL! 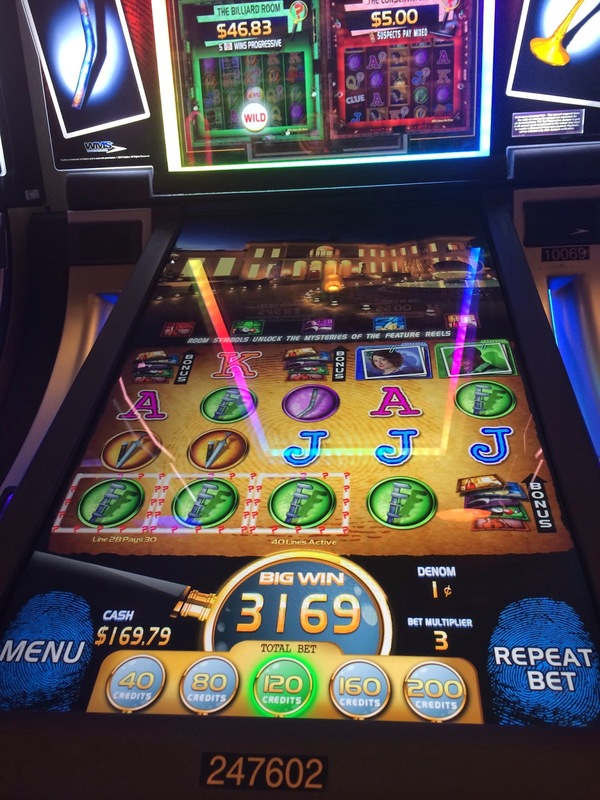 Sounds like you had a much better trip gambling wise this time compared to the last one, so congrats!! I've been intrigued by Rose.Rabbit.Lie since it opened and now you've been a couple of times I see. Is it worth going to see? What's the food like or do you just go for the show? It's a shame your stay was ruined by Drais - you'd have thought that someone would have thought about that before allowing them to open but I guess it takes all sorts to make a world and some people wouldn't mind - I'm on your side though and can't abide a noisy room! Hi Mark and Andrea, great to hear from you both! I didn't eat at Rose.Rabbit.Lie this trip but I did in February and enjoyed it. I have the menu and reviews at these links. The first show at 7:30 for 90 minutes is worth going to see but not at full price get one of the 50 percent off discounts that are available on Groupon, Living Social and Travel Zoo. I'm afraid nightclub noise is going to be a big part of LV, it's just a shame that most of those attending the clubs will eventually have hearing problems, IMO the music is way too loud even for the clobbers. Thanks for the good luck wishes! Cheers! Hi Diana! A wonderful trip report as always. Looking forward to your tweets for this upcoming trip. 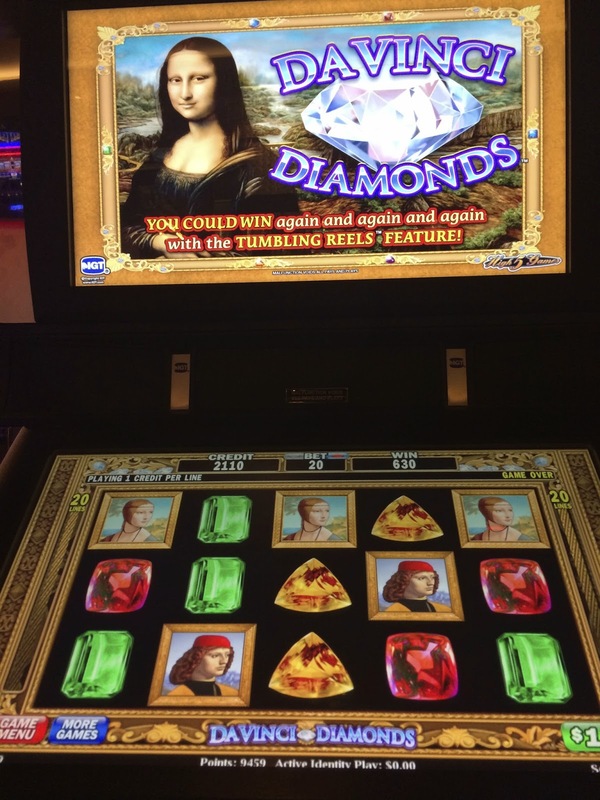 If you are back in the HL room at Cosmo, I would give the Diamond Queen that you first see upon walking into the HL room (multi-game, the one on the left in the row). I got a great bonus for $1100 on a $5 bet on it in April. Best of luck on your trip! Hi Tim, sorry I didn't tweet as much this trip but I was so busy and then I just blame it on being tired. :) I didn't make it to Cosmo this trip but I did try in May the Diamond Queen at Cosmo that you won on but it was a fail for me. 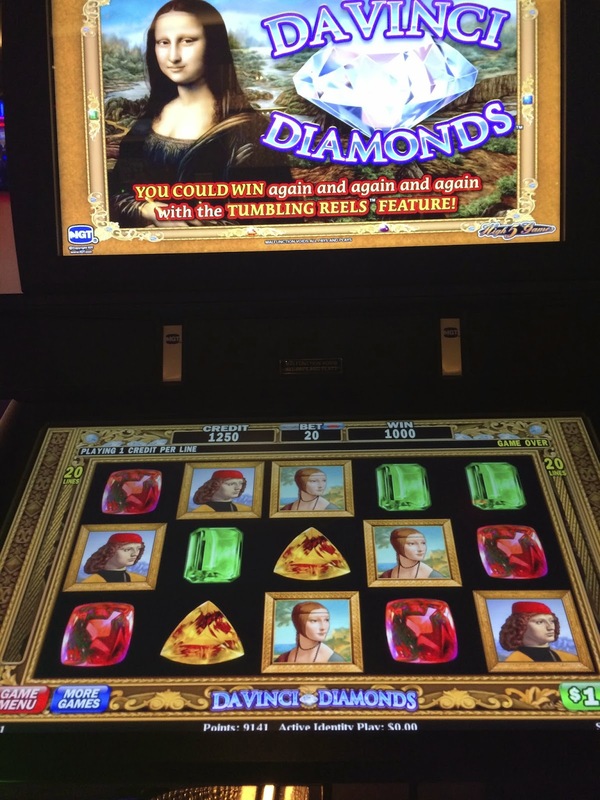 Boots has also won on that Diamond Queen, so I'll keep trying it when I find myself at Cosmo in the future. I did have some really nice wins this trips and got some great videos of them. Thanks for the comments, always great to hear from you! I love your blog, and thanks for all the great pictures and videos. Question I have is... does it really pay to use your players card? Heading to Vegas for my 50th in September, and am starting to wonder about that. Staying at the Golden Nugget by the way. IMO, it's always important to use your player's card because if you don't you won't know what comps you missed out on getting in the future. It doesn't effect your slot or gambling outcome to use one. Have a great 50th birthday in Vegas in September. Hope you wins lots! Hey Diana! I love reading your trip reports, and of course watching you play on youtube! Im going to be going to Vegas in December and im trying to get some ideas for when I go, I was wondering if you ever saw Ka and if you liked it or not? One last thing have you ever used the MyVegas game on Facebook? Do you think its worth the time? I can't wait to read your next reports! I haven't seen Ka since they changed the ending of the show but previous to that I had seen it twice and liked it. Both my husband and son say it's one of their favorite Cirque shows. 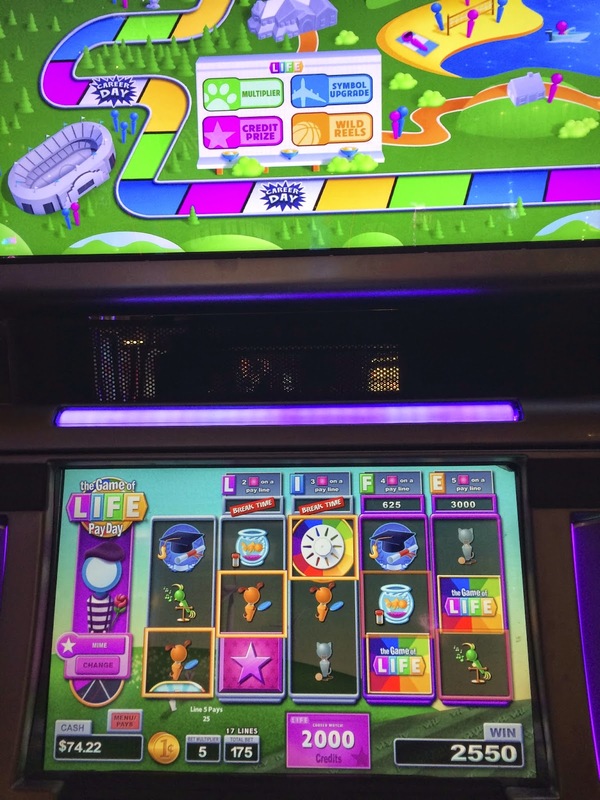 I do play MyVegas on Facebook and it's been worth the time for me in the past as I have found once you have all your M-life properties in place just logging in once a day and spinning the wheel and collecting my coins works well for me. I save the coins up until I have 500k or more and then put the games on auto to hopefully earn the most loyalty gold coins for the freebies for the least amount of time spent. Having said that, a lot of the prizes lately haven't been as good as when the game first came out and they seem to increase the loyalty points for the prizes every few months. You might want to review the rewards they are offering currently to see if you feel any of those would be useful for you before spending time playing the game. Also if you do a search on FB you will discover a couple groups such as myvegas friends which you can ask to join that will help give you tips on optimizing your play on Myvegas and also answer any questions you might have on rewards and redeeming them.